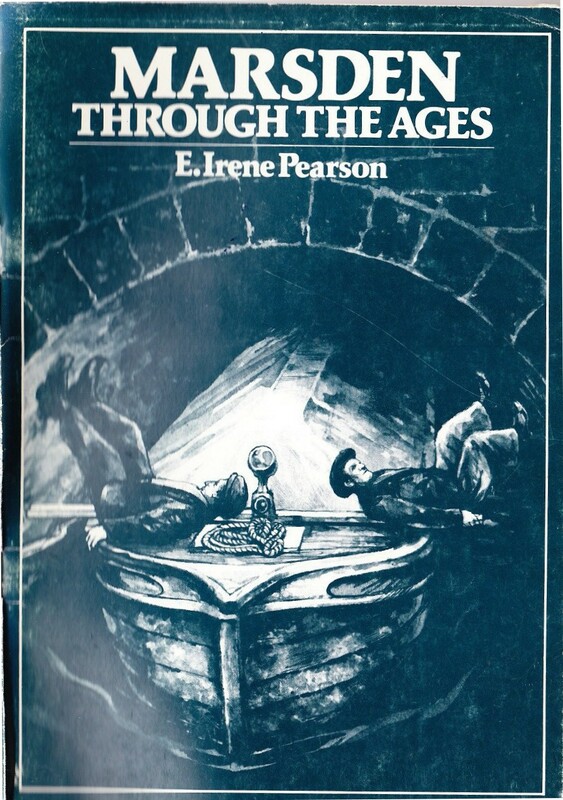 The following booklet was published in 1984 by E. Irene Pearson. It was not published by the MCA. 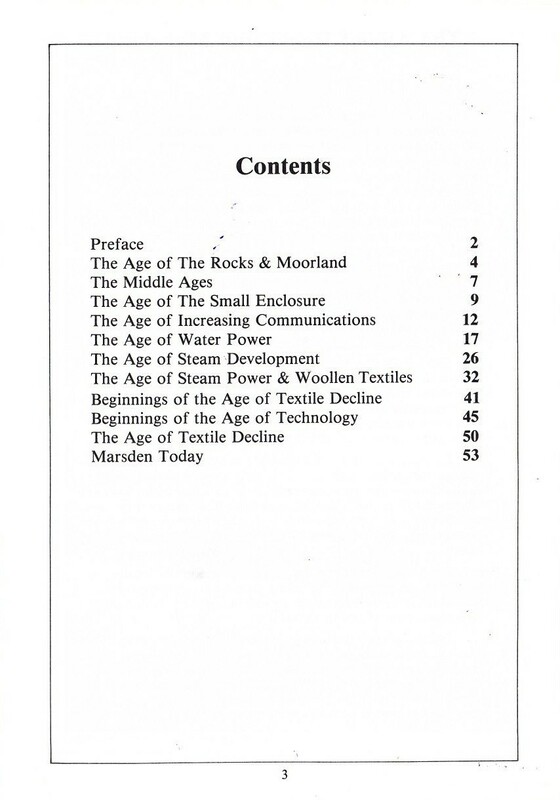 It has been scanned in and is available here as is a good source of information on Marsden. 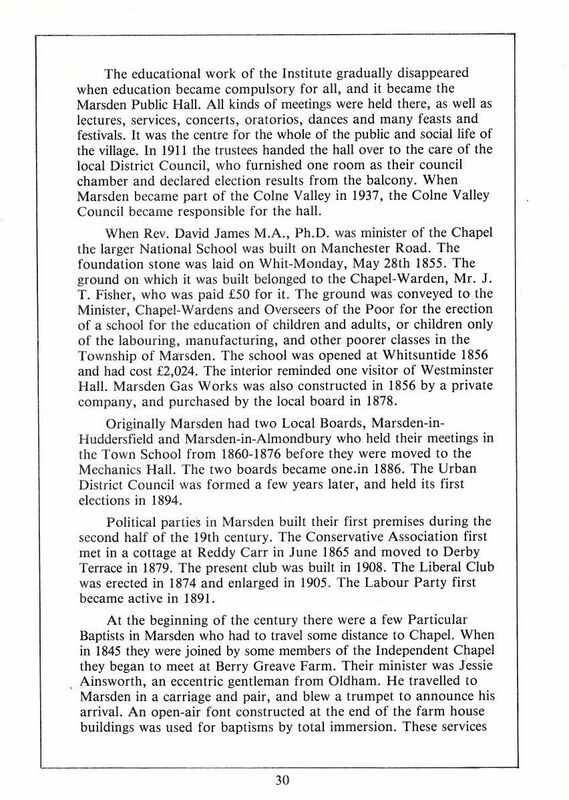 For this brief outline of the history of Marsden I have found much helpful information in the two books “Some Records of Ye Chapell of Marsden” by Rev. A. R. Barratt written in I9l0 and in “Bygone Marsden” by L. B. Whitehead published in 1942. 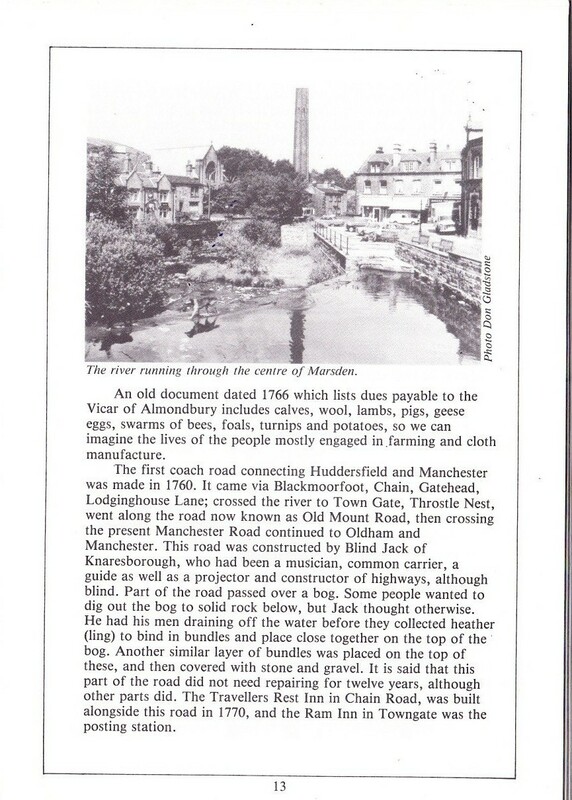 Other interesting information I found in copies of Colne Valley Guardian, and Colne Valley Almanack preserved in the Local History Library in Huddersfield. 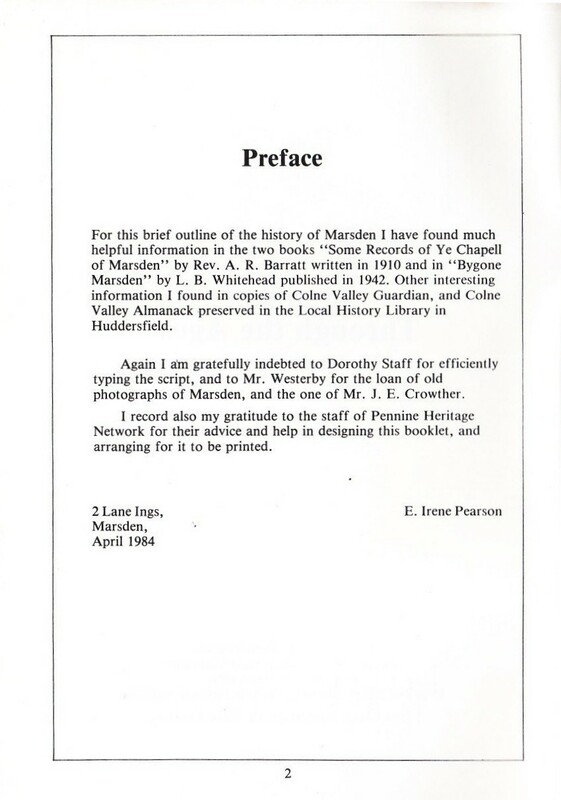 Again I am gratefully indebted to Dorothy Staff for efficiently typing the script, and to Mr. Westerby for the loan of old photographs of Marsden, and the one of Mr. J. E. Crowther. I record also my gratitude to the staff of Pennine Heritage Network for their advice and help in designing this booklet, and arranging for it to be printed. Marsden or March-dene as it is named in old documents probably means boundary valley. Such is the position of Marsden being the head of Colne Valley, seven miles from Huddersfield and eighteen from Manchester. Surrounded by hills rising to 1600 feet and more, it forms an almost enclosed community with only one way through it, from east to west along Manchester Road. Communication with hamlets and villages surrounding it in the Pennines is mainly along pack horse tracks or on bridle paths. The best known of these is the one still known as Packhorse Road. 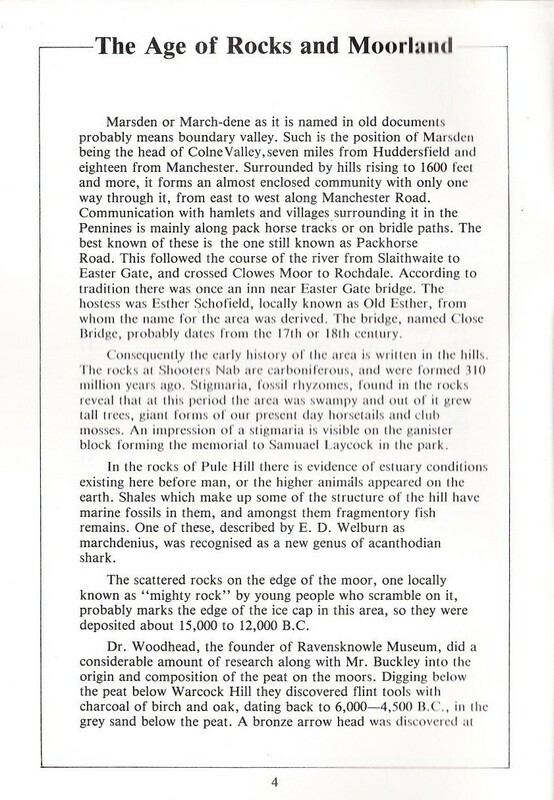 This followed the course of the river from Slaithwaite to Easter Gate, and crossed Clowes Moor to Rochdale. 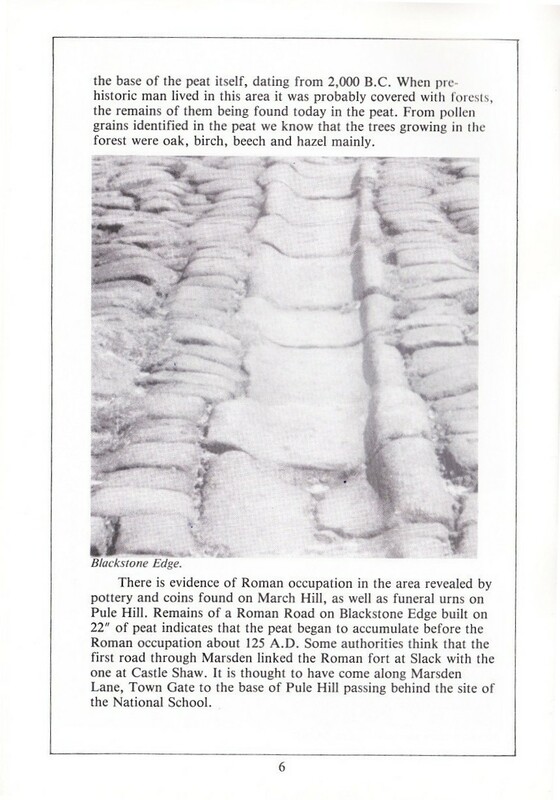 According to tradition there was once an inn near Easter Gate bridge. The hostess was Esther Schofield, locally known as Old Esther, from whom the name of the area was derived. The bridge, named Close Bridge, probably dates from the 17th or 18th century. Consquently the early history of the area is written in the hills. The rocks at Shooters Nab are carboniferous, and were formed 310 million years ago. Stigmaria, fossil rhizomes, found in the rocks reveal that at this period the area was swampy and out of it grew tall trees, giant forms of our present day horsetails and club mosses. An impression of a stigmaria is visible on the ganister block forming the memorial to Samuael Laycock in the park. deposited about 15,000 to 12,000 B.C. Marsden from the surrounding hillside. Photo Don Gladstone. the base of the peat itself, dating from 2,000 B.C. When pre-historic man lived in this area it was probably covered with forests,the remains of them being found today in the peat. From pollen grains identified in the peat we know that the trees growing in the forest were oak, birch, beech and hazel mainly. There is evidence of Roman occupation in the area revealed by pottery and coins found on March Hill, as well as funeral urns on Pule Hill. 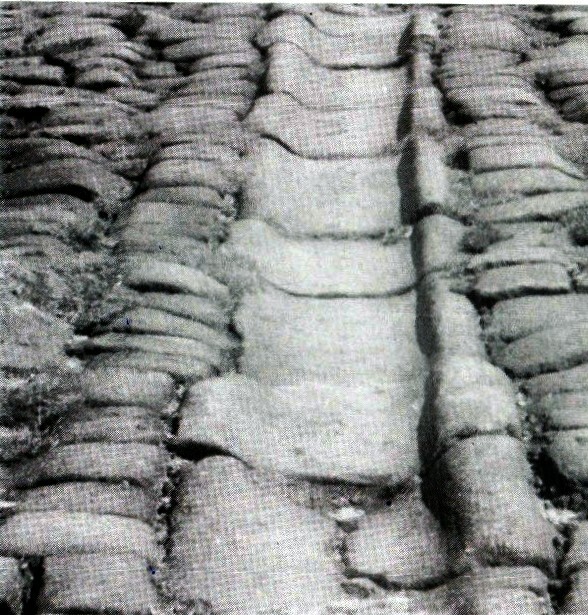 Remains of a Roman Road on Blackstone Edge built on 22” of peat indicates that the peat began to accumulate before the Roman occupation about 125 A.D. Some authorities think that the first road through Marsden linked the Roman fort at Slack with the one at Castle Shaw. It is thought to have come along Marsden Lane, Town Gate to the base of Pule Hill passing behind the site of the National School. The Manor of Marsden originally belonged to the Crown and formed part of the Honour of Pontefract, which was granted to Ilbert de Lacy by William the Conqueror in 1067. In 1273 Edward I, having returned from the Holy Land appointed a commission of inquiry into the state of his demesne lands. 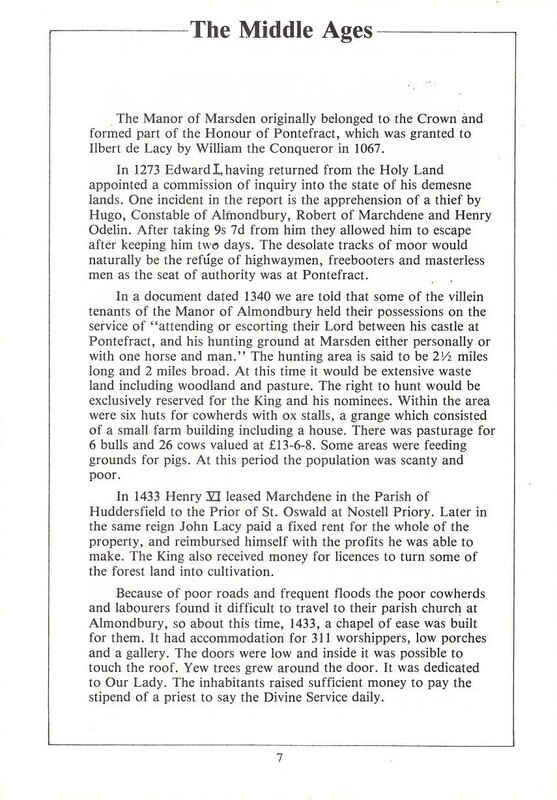 One incident in the report is the apprehension of a thief by Hugo, Constable of Almondbury, Robert of Marchdene and Henry Odelin. After taking 9s 7d from him they allowed him to escape after keeping him two days. 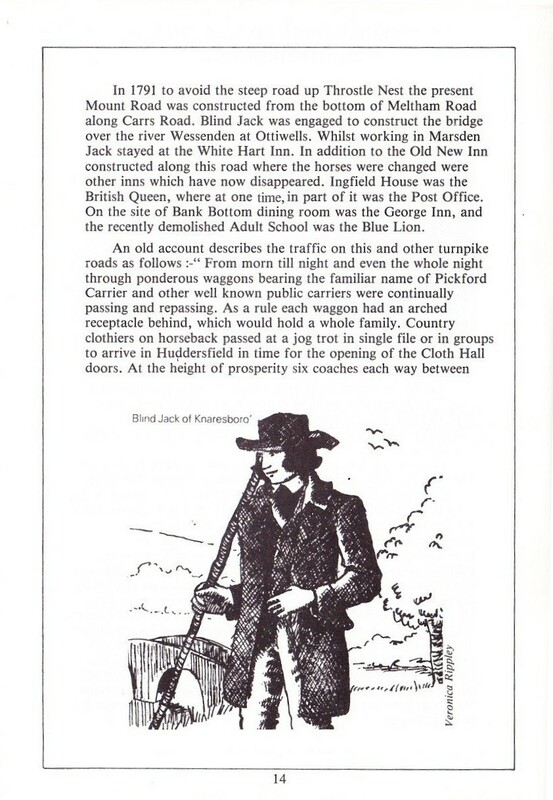 The desolate tracks of moor would naturally be the refuge of highwaymen, freebooters and masterless men as the seat of authority was at Pontefract. ln a document dated 1340 we are told that some of the villein tenants of the Manor of Almondbury held their possessions on the service of “attending or escorting their Lord between his castle at Pontefract, and his hunting ground at Marsden either personally or with one horse and man.” The hunting area is said to be 2 1/2 miles long and 2 miles broad. At this time it would be extensive waste land including woodland and pasture. The right to hunt would be exclusively reserved for the King and his nominees. Within the area were six huts for cowherds with ox stalls, a grange which consisted of a small farm building including a house. There was pasturage for 6 bulls and 26 cows valued at £13-6-8. Some areas were feeding grounds for pigs. At this period the population was scanty and poor. In 1433 Henry VI leased Marchdene in the Parish of Huddersfield to the Prior of St. Oswald at Nostell Priory. Later in the same reign John Lacy paid a fixed rent for the whole of the property, and reimbursed himself with the profits he was able to make. The King also received money for licences to turn some of the forest land into cultivation. In 1462 the manor became attached to the Duchy of Lancaster. By 1480 the manor was leased and let to be farmed. The owners increased the dues, and imposed heavier charges on the tenants so that the inhabitants could no longer pay their priest. They appealed to the King Edward VI in his capacity as Duke of Lancaster for help. He gave them four marks annually, and this has been paid to the church ever since. At this time and for many centuries Marsden was divided into two by the river, viz. Marsden in Huddersfield to the north and Marsden in Almondbury to the south. 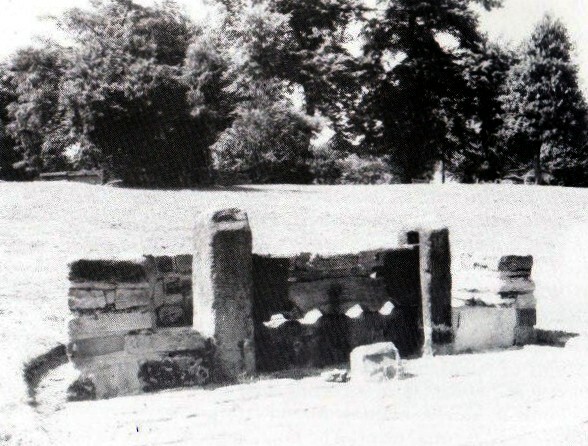 It is possible that the stocks were erected about this time and were last used in 1821. Near to the church was the White Hart Inn, also named the Hare & Hounds at one time. This ceased to be an inn in 1910, but it still remains today as a private dwelling. There is a record of a Manor Court in 1496-7, and that the privilege of copyhold tenure was granted to the inhabitants in 1500, at a time when the population was increasing. Little is recorded about Marsden in the 16th century except that the population in 1557 was 400. From a roll of the Hearth Tax dated 1666 we learn that there were about 550 people living in 82 houses in Marsden. 58 of the houses had one hearth, 19 had two, 4 had three and one had 4 hearths. The tax on the remaining hearths was “omitted by reason of poverty.” Most of the houses were small cottages grouped in hamlets for protection and company, and built on sloping ground so that they were protected by the higher ground behind them. One such group was in the Dean where the oldest remaining cottage at Higher Green Owlers is dated 1610, Another group was on Pule Side, of which three still remain, viz. one with the inscription I.M.M.I, 1641, Green Top 1671, and one at Clark Hill dated 1673. Berry Greave Farm, one of a group just off Waters Road is the oldest remaining farm dated 1685. The Manor House first built in 1616 still nestles in a hollow in Pule Hill. On February 21st 1746 John Wesley stayed the night at the Manor House on his way from a preaching campaign in Lancashire. Seven years later on his second visit to Marsden he preached at a cottage at Badger Gate. Although just outside the boundary of Marsden, Slaithwaite Hall belongs to this period. According to tradition it was a fine building with high gables, and a considerable amount of stained glass in the windows. During this period the centre of the village was where the two rivers, the river Colne and river Wessenden, meet. From the diary of Rev. Robert Meeke, a Slaithwaite incumbent, it would appear that Marsden did not have its own incumbent minister towards the end of the century, as he records several visits to Marsden to take services and funerals. He records the Rush Bearing ceremony held on August 24th 1691. This was carried out every year covering the floor of the church with fresh rushes to prepare for the cold of winter. The event was a general holiday, and the following Sunday was carefully observed. When the dedication of the chapel changed from St. Mary to St. Bartholomew is not known, but it has been suggested that it arose from the custom of holding the Rush Bearing on St. Bartholomew‘s Day. Towards the end of this century, a will dated 1680 restores to the church the oldest piece of church plate still in use, a silver chalice and cover which dates from the Elizabethan period. Hey Green corn mill, built in 1710.
who died 24 years later were buried in the chapel. This was the pattern of life in the village at the beginning of the 18th century. In 1724 William Ratcliffe purchased the Manor of Marsden for £495. of the Kaye family who owned it. Steep Farm has the inscription J C C S 1773, and cottages at Clough Lea the inscription 1782 JP-SP. Idle Row was built tn 1797. 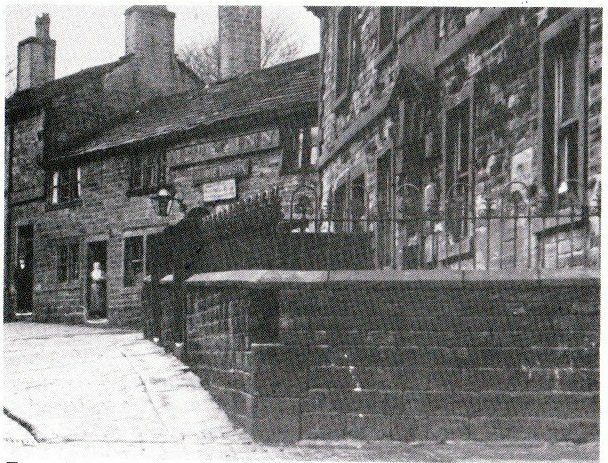 The two narrow streets m Planks dated 1744 and the Two Dutchmen Inn 1745, along with other old buildings which at this time formed the centre of the village have been demolished in more recent times to make way for Wessen Court. three sides and seated 620 people. For many years the floor was of bare earth so that burials could take place inside the chapel. This privilege was so sought after that eventually in every available spot bodies were huddled together at a depth of only a few inches below the surface .Tradition says the pews were made in Saddleworth and brought on a waggon to Pule Gate as the roads were inadequate for it to come further. People flocked to carry the woodwork to the chapel and from curiosity to see the waggon which had never before been seen in Marsden. Mr. Samuel Haigh carted all the stone free of charge. The river running through the centre of Marsden. Photo Don Gladstone. An old document dated 1766 which lists dues payable to the Vicar of Almondbury includes calves, wool, lambs pigs, geese eggs, swarms of bees, foals, turnips and potatoes, so we can imagine the lives of the people mostly engaged m farming and cloth manufacture. 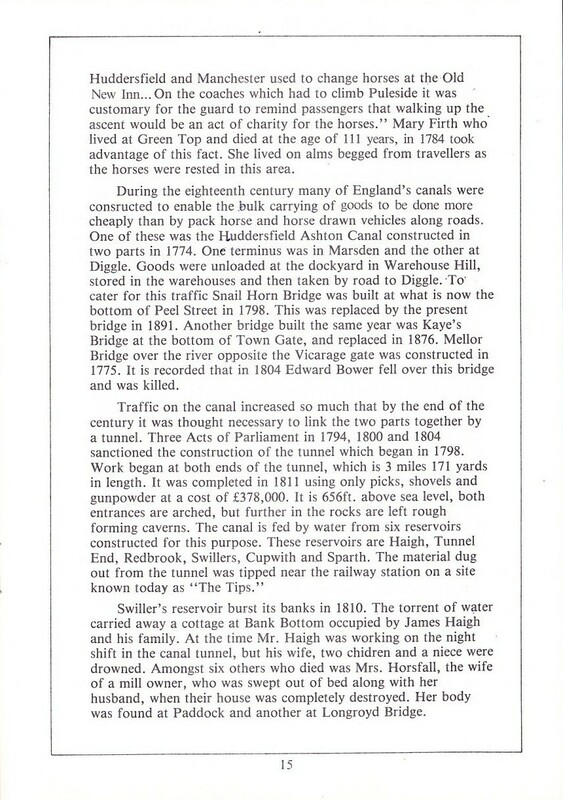 The first coach road connecting Huddersfield and Manchester was made m 1760 It came via Blackmoorfoot, Chain, Gatehead, Lodginghouse Lane; crossed the river to Town Gate, Throstle Nest, went along the road now known as Old Mount Road then crossing the present Manchester Road continued to Oldham and Manchester. 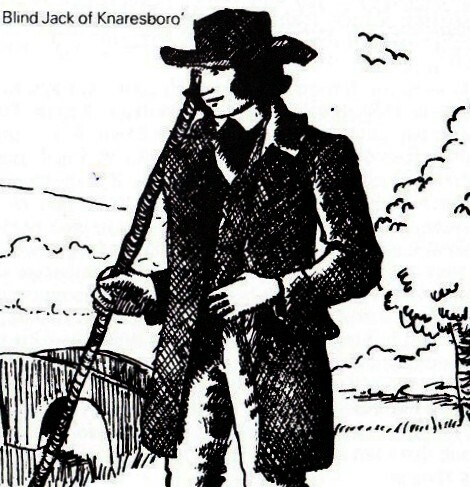 This road was constructed by Blind Jack of Knaresborough who had been a musician, common carrier, a guide as well as a projector and constructor of highways although blind. Part of the road passed over a bog. Some people wanted to dig out the bog to solid rock below, but Jack thought otherwise. He had his men draining off the water before they collected heather (ling) to bind in bundles and place close together on the top of the bog. Another similar layer of bundles was placed on the top of these and then covered with stone and gravel It is said that this part of the road did not need repairing for twelve years, although other parts did. The Travellers Rest Inn on Chain Road was built alongside this road in 1770 and the Ram Inn in Towngate was the posting station. Huddersfield and Manchester used to change horses at the Old New Inn… On the coaches which had to climb Puleside it was ‘ customary for the guard to remind passengers that walking up the ascent would be an act of charity for the horses.” Mary Firth who lived at Green Top and died at the age of 111 years, in 1784 took advantage of this fact. She lived on alms begged from travellers as the horses were rested in this area. During the eighteenth century many of England’s canals were constructed to enable the bulk carrying of goods to be done more cheaply than by pack horse and horse drawn vehicles along roads. One of these was the Huddersfield Ashton Canal constructed in two parts in 1774. One terminus was in Marsden and the other at Diggle. 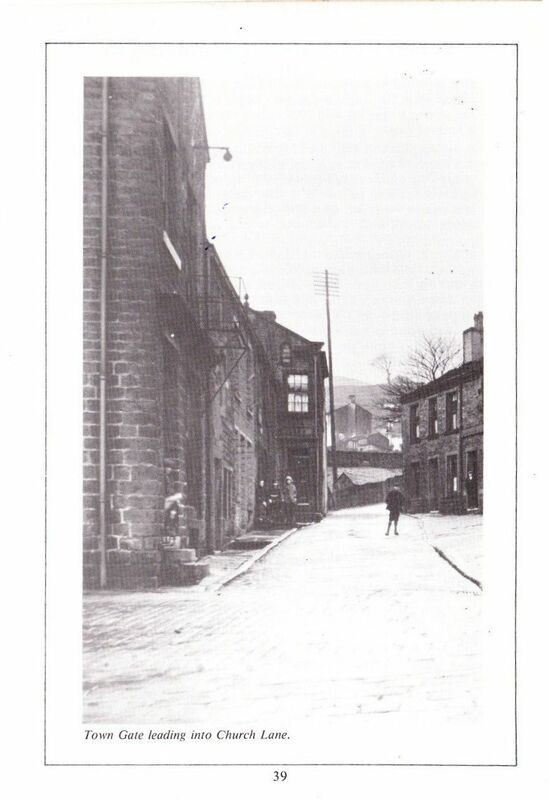 Goods were unloaded at the dockyard in Warehouse Hill, stored in the warehouses and then taken by road to Diggle. To cater for this traffic Snail Horn Bridge was built at what is now the bottom of Peel Street in 1798. This was replaced by the present bridge in 1891. Another bridge built the same year was Kaye’s Bridge at the bottom of Town Gate, and replaced in 1876, Mellor Bridge over the river opposite the Vicarage gate was constructed in 1775, It is recorded that in 1804 Edward Bower fell over this bridge and was killed. Swillers reservoir burst its banks in 1810. The torrent of water carried away a cottage at Bank Bottom occupied by James Haigh and his family. At the time Mr. Haigh was working on the night shift in the canal tunnel, but his wife, two chidren and a niece were drowned. Amongst six others who died was Mrs. Horsfall, the wife of a mill owner, who was swept out of bed along with her husband, when their house was completely destroyed. Her body was found at Paddock and another at Longroyd Bridge. 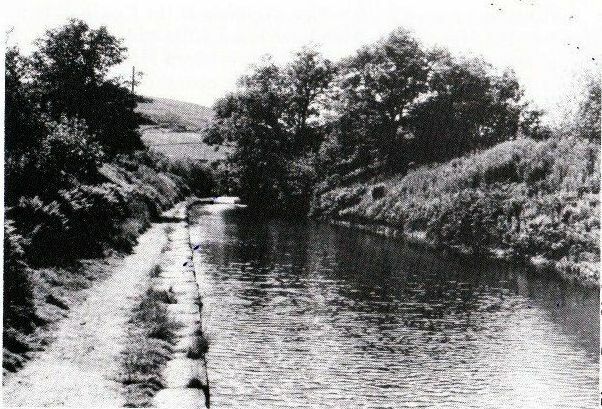 Barges were towed along the canal by horses walking along the tow path until the tunnel was reached and then taken through the tunnel by men called leggers. These men lay on the barge and pushed with their feet along the roof of the tunnel where it existed, and by boat hooks or poles along the rocky sides of the caverns The journey took 3 1/2 to 4 hours. them worked in their own homes and grew a patch of oats which supplied a great part of their diet. In 1786 there were several deaths from fever, possibly typhus. Only one case of smallpox is recorded that of Thomas, the one year old son of the Rev L Bellas. Two infant daughters who also died were buried under the altar in the chapel. 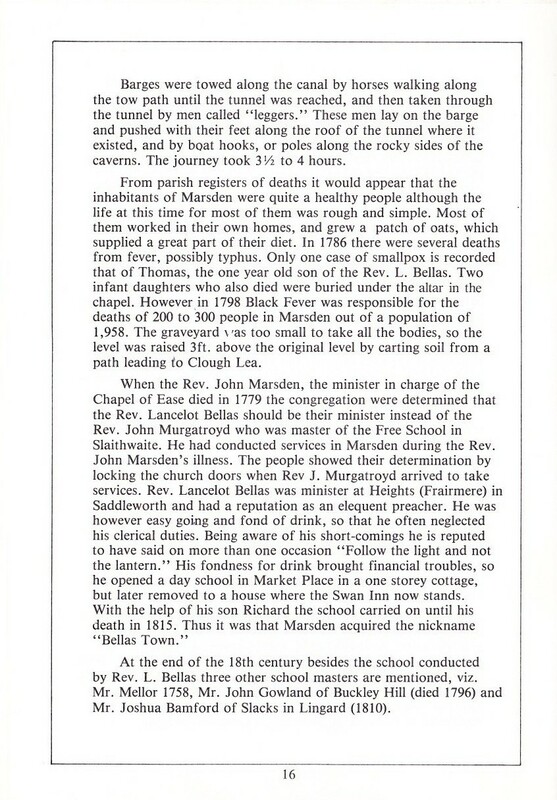 However in 1798 Black Fever was responsible for the deaths of 200 to 300 people in Marsden out of a population of 1,958. The graveyard was too small to take all the bodies, so the level was raised 3ft above the original level by carting soil from a path leading to Clough Lea. When the Rev. 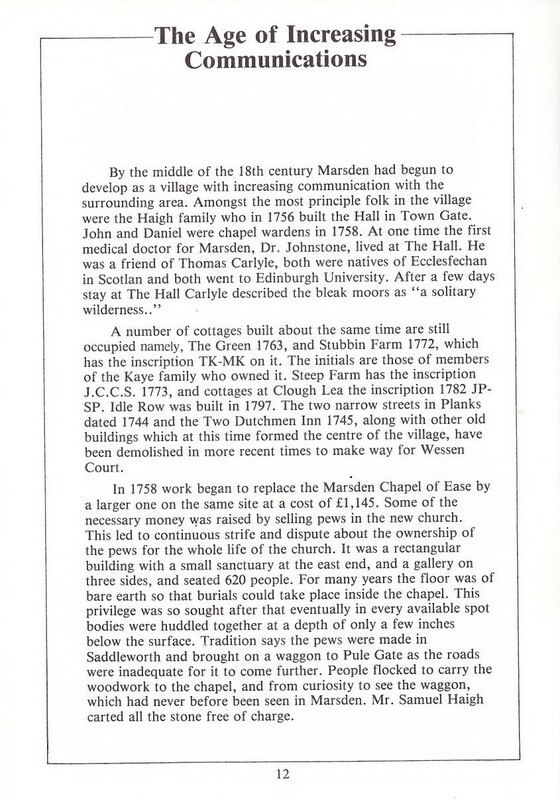 John Marsden the minister in charge of the Chapel of Ease died in 1779 the congregation were determined that the Rev. Lancelot Bellas should be their minister instead of the Rev. John Murgatroyd who was master of the Free School in Slaithwate. He had conducted services in Marsden during Rev. John Marsden s illness. The people showed their determination by locking the church doors when Rev. J Murgatroyd arrived to take services. Rev. Lancelot Bellas was minister at Heights (Frairmere) in Saddleworth and had a reputation as an eloquent preacher. He was however easy going and fond of drink so that he often neglected his clerical duties. Being aware of his short comings he rs reputed to have said on more than one occasion “Follow the light and not the lantern”. His fondness for drink brought financial troubles so he opened a day school in Market Place in a one storey cottage but later removed to a house where the Swan Inn now stands. At the end of the 18th century besides the school conducted by Rev L Bellas three other school masters are mentioned, viz. Mr. Mellor 1758, Mr. John Gowland of Buckley Hill (died 1796) and Mr. Joshua Bamford of Slacks in Lingard (1810). 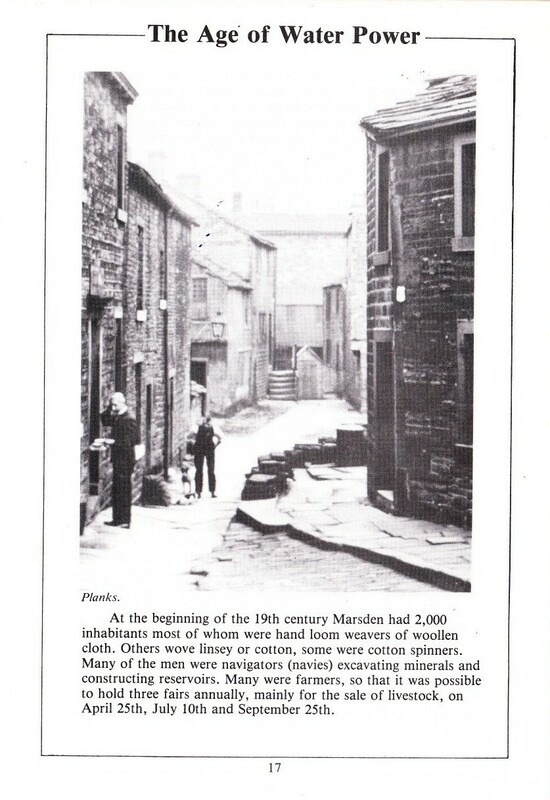 At the beginning of the 19th century Marsden had 2,000 inhabitants most of whom were hand loom weavers of woollen cloth, others wove Iinsey or cotton, some were cotton spinners. Many of the men were navigators (navies) excavating minerals and constructing reservoirs. Many were farmers, so that it was possible to hold three fairs annually, mainly for the sale of livestock, on April 25th, July 10th and September 25th. lt was at this time that the non comformist churches came into being. The first known as Independents first met in a cottage in Statlon Road and later in a larger house at the Green. This fact gave use to the local name for the Congregational Chapel being The Green Chapel for many years after it was built. In 1805 the first Sunday School began in the cottage at the Green to teach reading and writing as well as giving religious instruction. 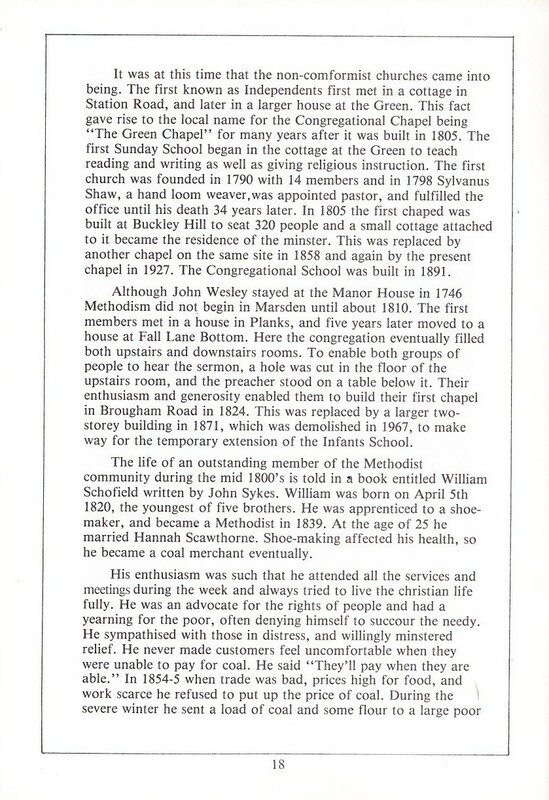 The first church was founded in 1790 with 14 members and in 1798 Sylvanus Shaw a hand loom weaver was appointed pastor and fulfilled the office until his death 34 years later. ln 1805 the first chapel was built at Buckley Hill to seat 320 people and a small cottage attached to it became the residence of the minister. This was replaced by another chapel on the same site in 1858 and again by the present chapel in 1927. The Congressional School was built in 1891. Although John Wesley stayed at the Manor House in 1746 Methodism did not begin in Marsden until about 1810. The first members met in a house in Planks and five years later moved to a house at Fall Lane Bottom. Here the congregation eventually filled both upstairs and downstairs rooms To enable both groups of people to hear the sermon a hole was cut in the floor of the upstairs room and the preacher stood on a table below it. Their enthusiasm and generosity enabled them to build their first chapel in Brougham Road in 1824. This was replaced by a larger two storey building in 1871 which was demolished in 1967 to make way for the temporary extension of the Infants School. 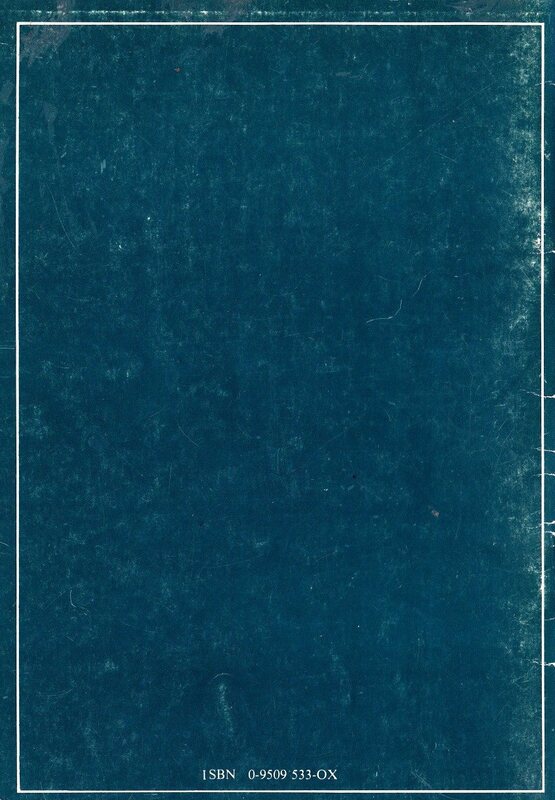 The life of an outstanding member of the Methodist community during the mid 1800s is told in a book entitled William Schofield written by John Sykes. William was born on April 5th 1820 the youngest of five brothers. He was apprenticed to a shoe maker and became a Methodist in 1839. At the age of 25 he married Hannah Scawthorne. Shoe making affected his health so he became a coal merchant eventually. His enthusiasm was such that he attended all the services and meetings during the week and always tried to live the christian life fully. He was an advocate for the rights of people and had a yearning for the poor often denying himself to succour the needy. family whose father was out of work and the mother did a bit of charing. He was a Sunday School Superintendent for thirty years, capable of interesting children, interested in the welfare of the school, zealous and punctual, and always one of those heading the Whitsuntide procession. 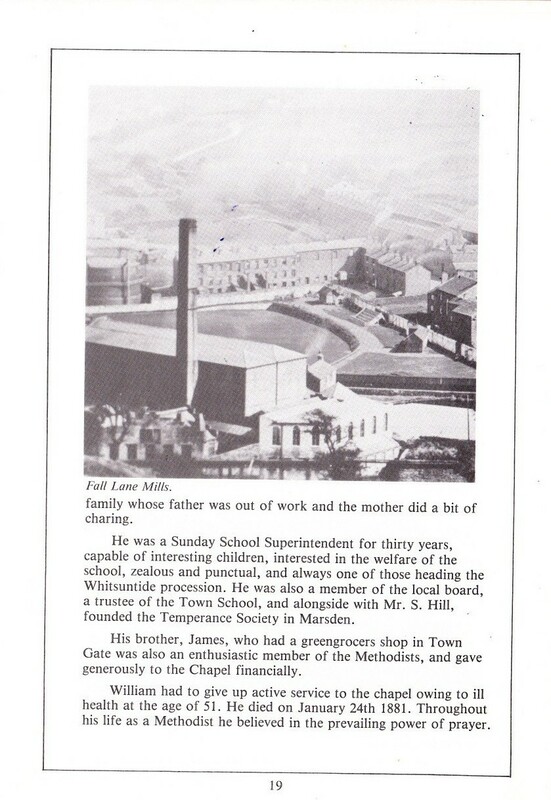 He was also a member of the local board, a trustee of the Town School, and alongside with Mr. S. Hill, founded the Temperance Society in Marsden. His brother, James, who had a greengrocers shop in Town Gate was also an enthusiastic member of the Methodists and gave generously to the Chapel financially. William had to give up active service to the chapel owing to ill health at the age of 51. He died on January 24th 1881. Throughout his life as a Methodist he believed in the prevailing power of prayer. woollen mill in 1841. The employees worked fourteen to fifteen hours a day, six days a week. All these mills were along the river banks as power was supplied by water wheels. Social and economic conditions were at a low ebb, and were little better for the succeeding half century. Food was often quite inadequate for the support and maintenance of health and strength. Along the banks of the Wessenden were other small mills. and an old mill in Fall Lane were used for carding and spinning. On the site of the present Crowther Bruces Mill (Colne Valley Spinning Co.) was New Mill, which manufactured cotton and printed fabrics. Nearby was a quaint old fashioned structure called “Frank Mill or “Bob Mill”. This mill was kept busy doing “country work”. 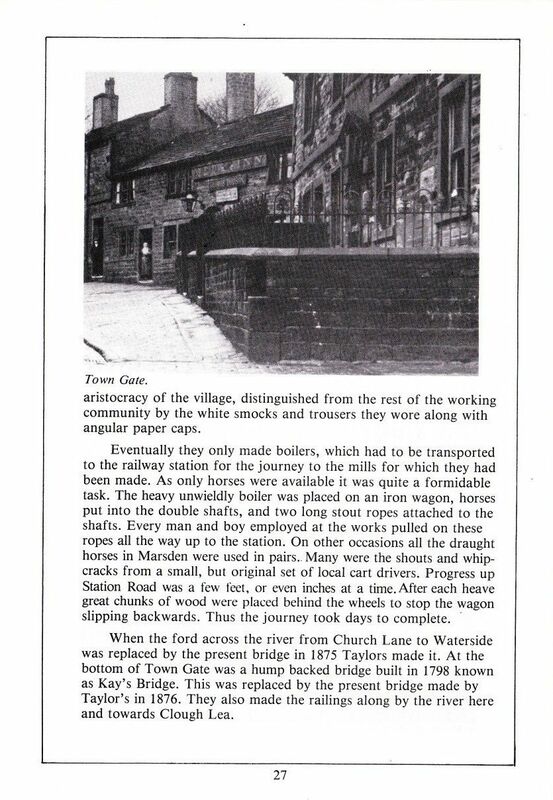 Yarn was carried to and from the weavers’ cottages by donkeys. 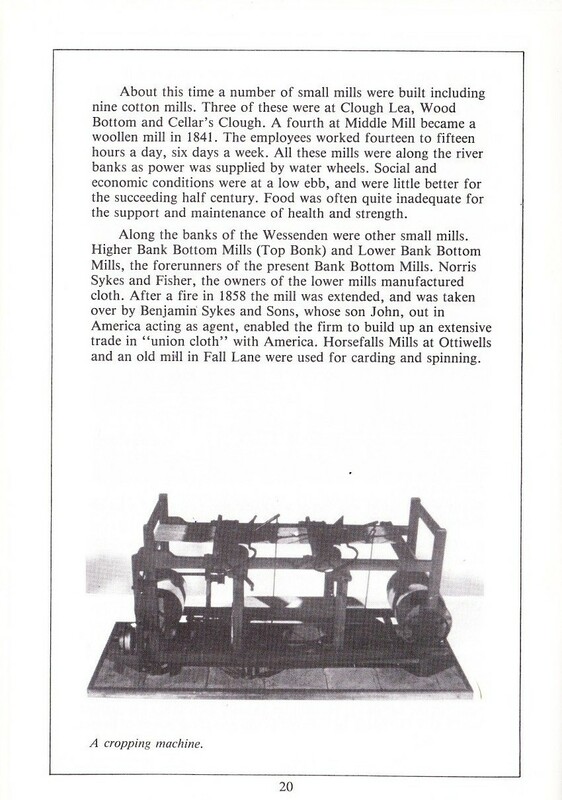 At Warehouse Hill there was a silk mill owned by three cousins, John. George and Sam Firth who came from Halifax. 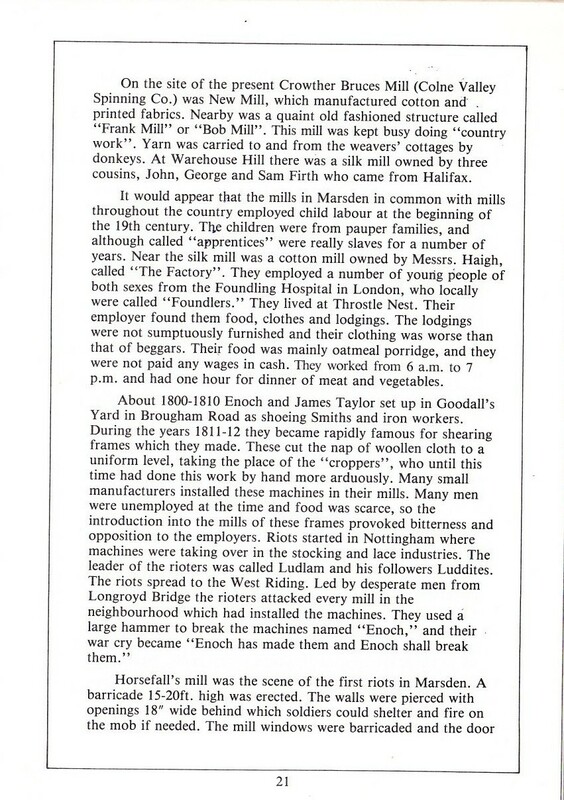 It would appear that the mills in Marsden in common with mills throughout the country employed child labour at the beginning of the 19th century. The children were from pauper families, and although called “apprentices” were really slaves for a number of years. 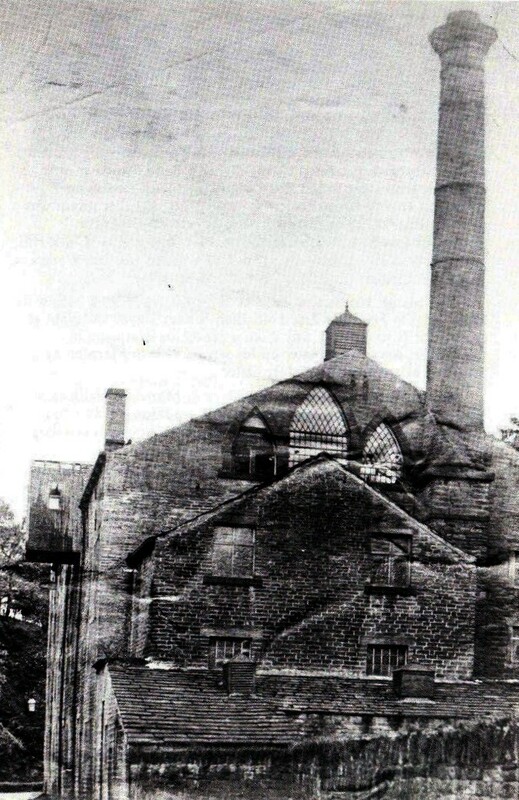 Near the silk mill was a cotton mill owned by Messrs. Haigh, called “The Factory”. They employed a number of young people of both sexes from the Foundling Hospital in London, who locally were called “Foundlers”. They lived at Throstle Nest. Their employer found them food, clothes and lodgings. The lodgings were not sumptuously furnished and their clothing was worse than that of beggars. Their food was mainly oatmeal porridge, and they were not paid any wages in cash. They worked from 6am to 7pm. and had one hour for dinner of meat and vegetables. carefully watched, guards placed within and every precaution taken. One of the meeting places for the rioters was at the Moorcock Inn on Mount Road. 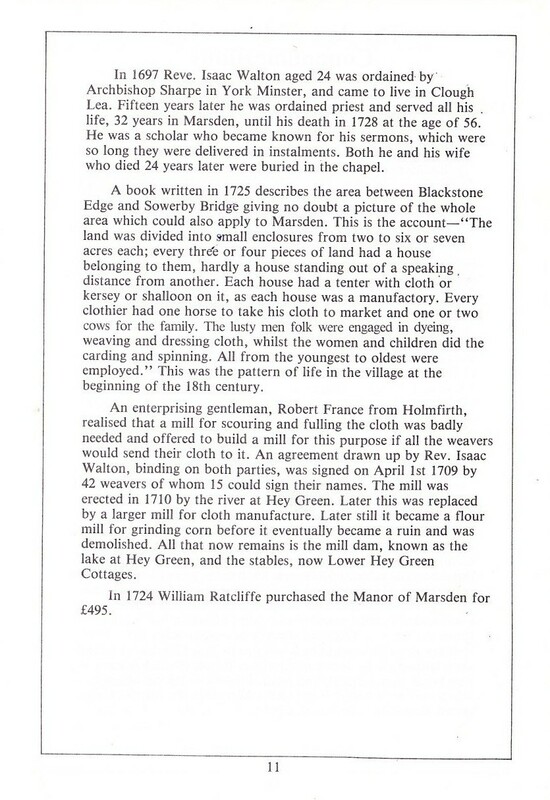 Mr. William Horsfall was murdered on Tuesday, April 28th 1812 as he rode home from Huddersfield market. He was shot through the back and died in the Warren House Inn, Milnsbridge. This incident brought the Luddite Rebellion to an end. The ring leaders were hanged in York on January 18th 1813. 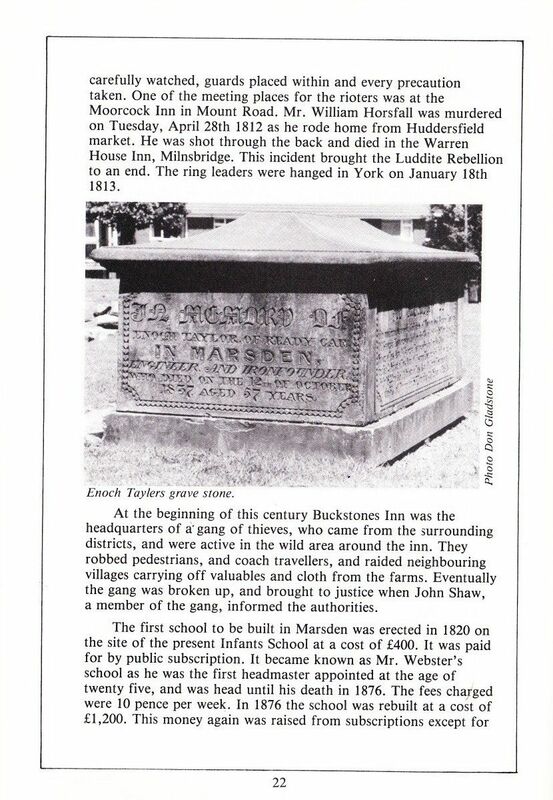 At the beginning of this century Buckstones Inn was the headquarters of a gang of thieves, who came from the surrounding districts, and were active in the wild area around the inn. They robbed pedestrians, and coach travellers, and raided neighbouring villages carrying off valuables and cloth from the farms. Eventually the gang was broken up, and brought to justice when John Shaw, a member of the gang, informed the authorities. £400 which was raised by holding a Bazaar at Easter 1881. Shortly afterwards the school received a government grant when the average attendance was 110. In 1879 an Infants Department was opened in the Mechanics Hall, and Miss D. Killin was appointed mistress. The Rev. 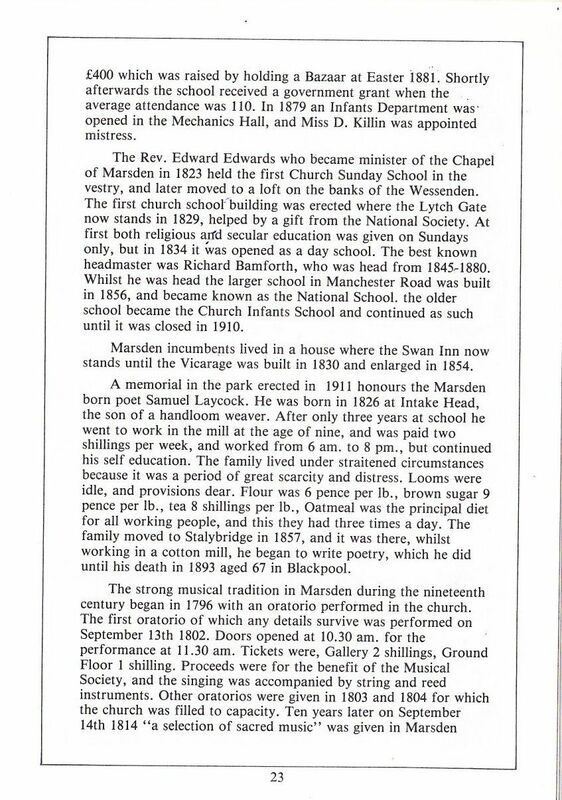 Edward Edwards who became minister of the Chapel of Marsden in 1823 held the first Church Sunday School in the vestry, and later moved to a loft on the banks of the Wessenden. The first church school building was erected where the Lytch Gate now stands in 1829, helped by a gift from the National Society. At first both religious and secular education was given on Sundays only, but in 1834 it was opened as a day school. The best known headmaster was Richard Bamforth, who was head from 1845-1880. Whilst he was head the larger school in Manchester Road was built in 1856, and became known as the National School. The older school became the Church Infants School and continued as such until it was closed in 1910. 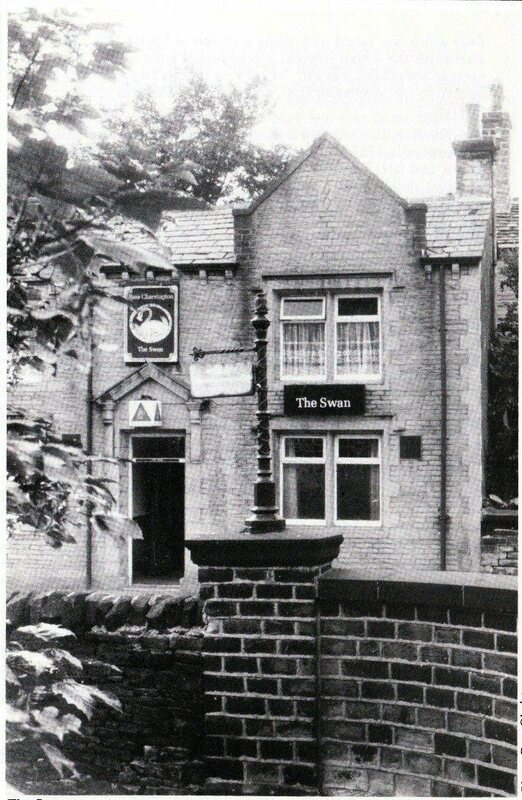 Marsden incumbents lived in a house where the Swan Inn now stands until the Vicarage was built in 1830 and enlarged in 1854. A memorial in the park erected in 1911 honours the Marsden born poet Samuel Laycock. He was born in 1826 at Intake Head, the son of a handloom weaver. After only three years at school he went to work in the mill at the age of nine, and was paid two shillings per week, and worked from 6 am. to 8 pm., but continued his self education. The family lived under straitened circumstances because it was a period of great scarcity and distress. Looms were idle, and provisions dear. Flour was 6 pence per lb., brown sugar 9 pence per lb., tea 8 shillings per lb., Oatmeal was the principal diet for all working people, and this they had three times a day. The family moved to Stalybridge in 1857, and it was there, whilst working in a cotton mill, he began to write poetry, which he did until his death in 1893 aged 67 in Blackpool. instruments. Other oratorios were given in 1803 and 1804 for which the church was filled to capacity. Ten years later on September 14th 1814 “a selection of sacred music” was given in Marsden. Chapel at 12 30 pm. The price of tickets was Increased to 2/6 for the south gallery, 2/- for the north gallery, and 1/- for seats on the ground floor. The Rev. E. Edwards revived the practice of giving oratorios in the chapel on Feast Monday in 1834,1836 and 1840. 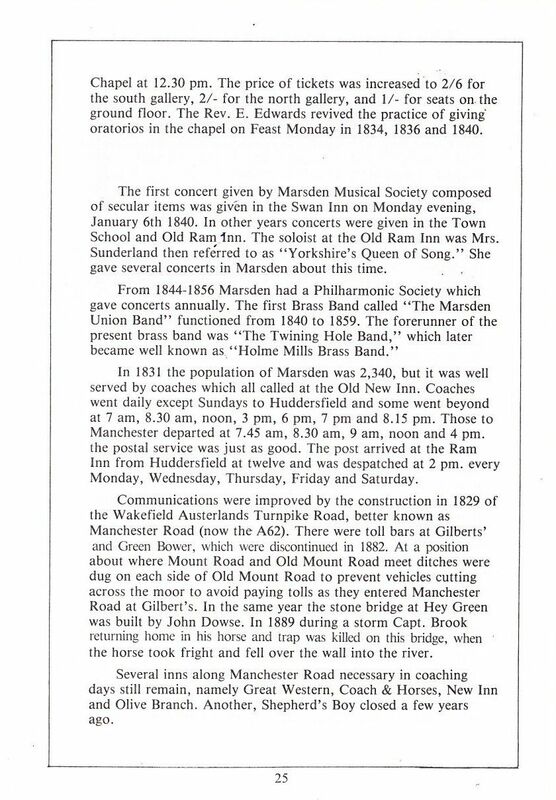 The first concert given by Marsden Musical Society composed of secular items was given in the Swan Inn on Monday evening January 6th 1840. In other years concerts were given in the Town School and Old Ram inn. 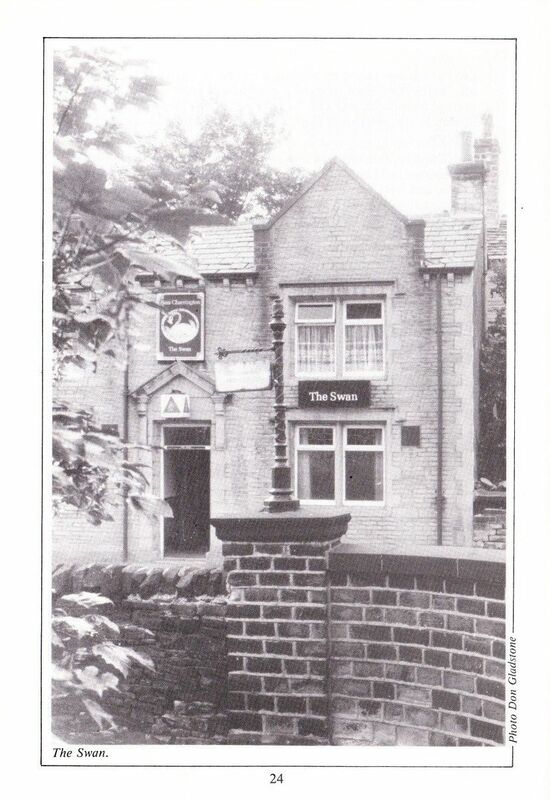 The soloist at the Old Ram Inn was Mrs. Sunderland then referred to as “Yorkshire s Queen of Song”. She gave several concerts in Marsden about this time. From 1844 – 1856 Marsden had a Philharmonic Society which gave concerts annually. The first Brass Band called The Marsden Union Band functioned from 1840 to 1859. The forerunner of the present brass band was The Twining Hole Band which later became well known as Holme Mills Brass Band. In 1831 the population of Marsden was 2,340, but it was well served by coaches which all called at the Old New Inn. Coaches went daily except Sundays to Huddersfield and some went beyond at 7 am, 8 30 am, noon, 3 pm, 6 pm, 7 pm, and 8.15 pm. Those to Manchester departed at 7.45 am, 8.30 am, 9 am, noon and 4 pm. The postal service was just as good. The post arrived at the Ram Inn from Huddersfield at twelve and was dispatched at 2 pm every Monday, Wednesday, Thursday, Friday and Saturday. Communications were improved by the construction in 1829 of the Wakefield Austerlands Turnpike Road better known as Manchester Road (now the A62). There were toll bars at Gilberts and Green Bower which were discontinued in 1882. At a position about where Mount Road and Old Mount Road meet ditches were dug on each side of Old Mount Road to prevent vehicles cutting across the moor to avoid paying tolls as they entered Manchester Road at Gilberts .In the same year the stone bridge at Hey Green was built by John Dowse. In 1889 during a storm Capt. Brook returning home on his horse and trap was killed on this bridge when the horse took fright and fell over the wall into the river. Several inns along Manchester Road necessary in coaching days still remain namely Great Western, Coach & Horses, New Inn and Olive Branch. Another, Shepherd’s Boy closed a few years ago. A single man	one day’s work per week at 1s. 6d. Man, Wife and Child 2 day’s work per week at 3s. 0d. Man, Wife with Two or more children 3 day’s work per week	4s. 6d. oatmeal, and 4 ½ d’ per stone for best potatoes. 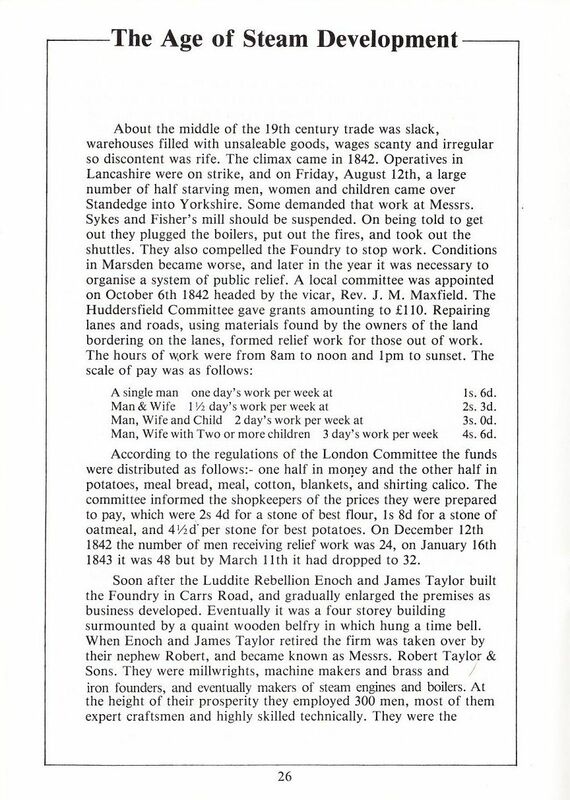 On December 12th 1842 the number of men receiving relief work was 24, on January 16th 1843 it was 48 but by March 11th it had dropped to 32.
horses in Marsden were used in pairs. Many were the shouts and whip cracks from a small but original set of local cart drivers. Progress up Station Road was a few feet or even inches at a time. After each heave great chunks of wood were placed behind the wheels to stop the wagon slipping backwards. Thus the journey took days to complete. 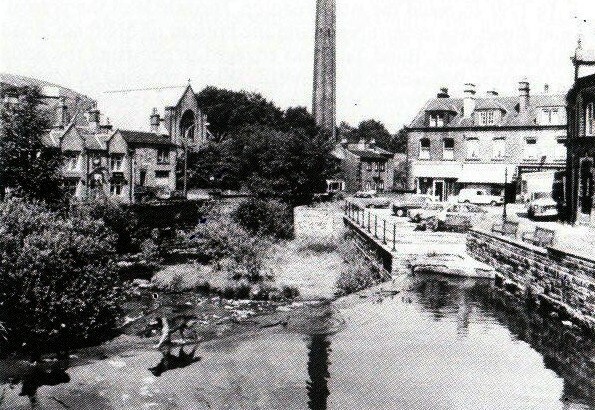 When the ford across the river from Church Lane to Waterside was replaced by the present bridge in 1875 Taylor’s made it. At the bottom of Town Gate was a hump backed bridge built in 1798 known as Kay’s Bridge. 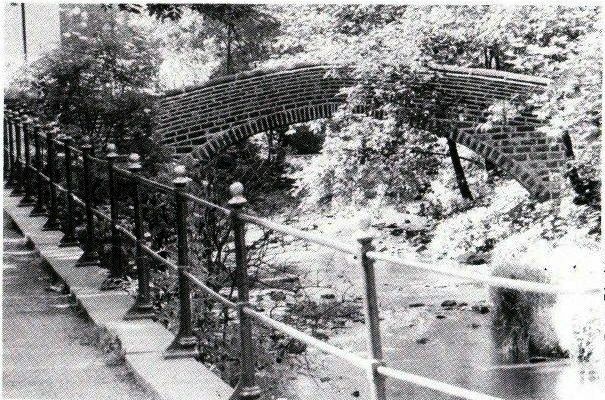 This was replaced by the present bridge made by Taylor’s in 1876. They also made the railings along by the river here and towards Clough Lea. for the double track railway, constructed between 1890 and 1894, was for the L. and N. W. Railway, and they were their own contractors. A 480ft. waterfall from Redbrook Reservoir ventilates the railway tunnels. In addition to the reservoirs made to supply the canal, one, Wessenden, was built in 1790 to keep the water wheels lower down the valley turning for the mill owners. lt was enlarged in 1842 making the water surface 19 acres, and owned by the Wessenden Commissioners. 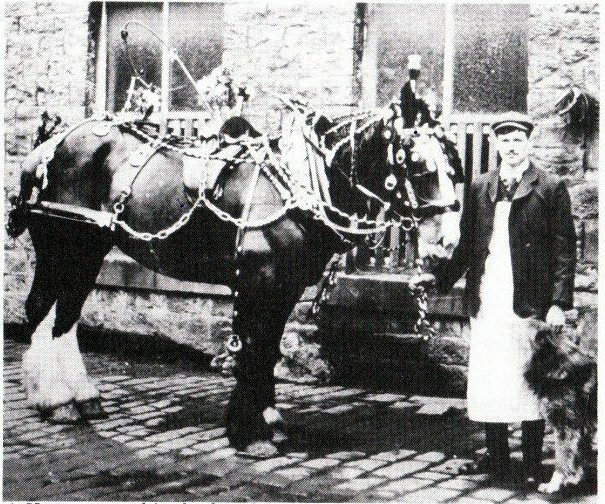 A Horse, as used in the foundry. Huddersfield Corporation bought this reservoir, when it purchased the water rights for the whole of Wessenden in 1890 at a cost of £50,000. The other three reservoirs in the valley were constructed for Huddersfield Corporation, Wessenden Head between 1877 and 1881, Blakley between 1896 and 1903, and Butterley between 1891 and 1906. Deer Hill reservoir at a height of 1,200 feet was built between 1870 and 1875 at a cost of £127,095. foundations were strong enough to carry the weight of a stone tower. The opening of the hall in 1862 was a great event, including a grand procession headed by a brass hand and with many decorative flags and banners touring the village. This was followed by speech making, tea drinking and other activities to celebrate the event. In the hall the number of volunteer teachers increased and classes were reorganised. Some evenings were devoted to reading, composition, geography, writing, arithmetic, grammar, singing, etc. Terms of membership were arranged to meet the pockets of all comers. Social and musical tastes of the members as well as the general public were catered for, including public lectures from time to time. A library was established in the Institute which at one time had 2,500 volumes in it, and was housed in a spacious room on the ground floor. the larger National School was built on Manchester Road. The foundation stone was laid on Whit Monday May 28th 1855. 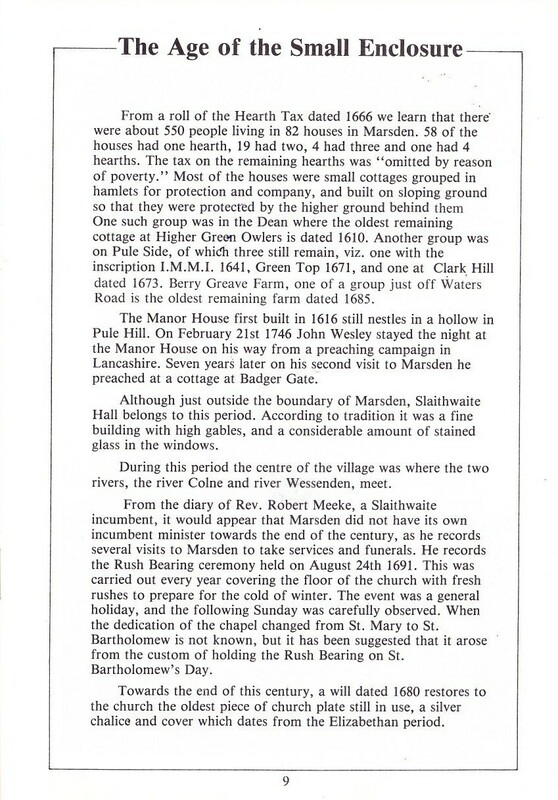 The ground on which it was built belonged to the Chapel Warden Mr. J T Fisher who was paid £50 for it. The ground was conveyed to the Minister, Chapel Wardens and Overseers of the Poor for the erection of a school for the education of children and adults or children only of the labouring manufacturing and other poorer classes in the Township of Marsden. 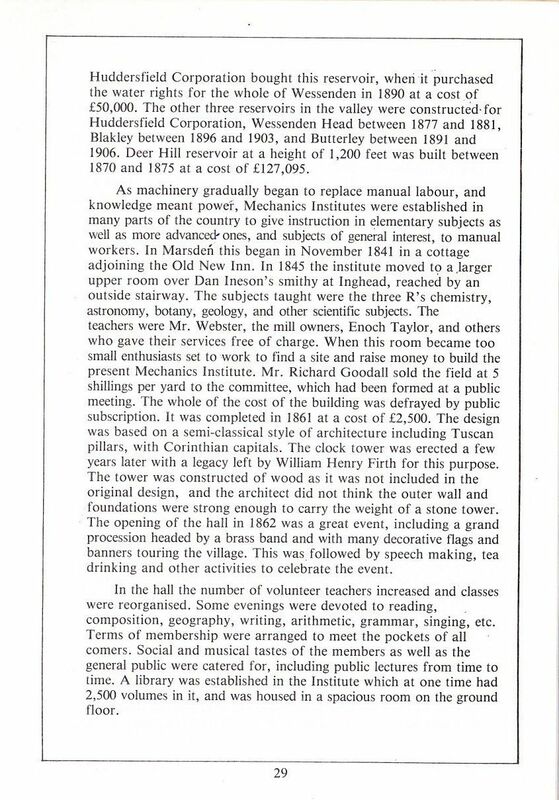 The school was opened at Whitsuntide 1856 and had cost £2,024. The interior reminded one visitor of Westminster Hall. 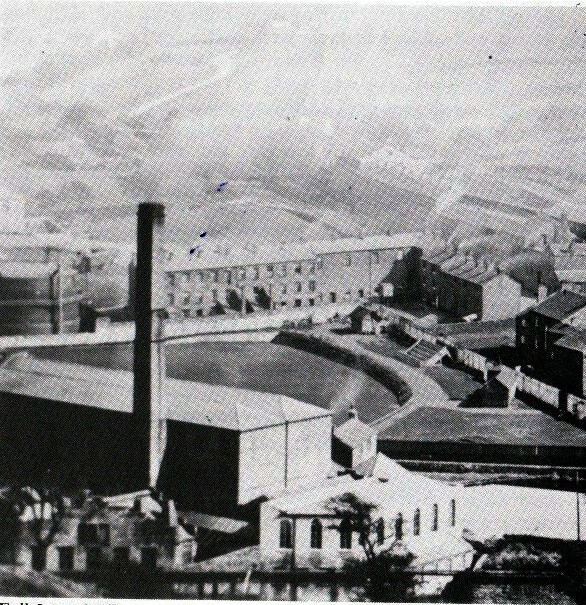 Marsden Gas Works was also constructed in 1856 by a private company and purchased by the local board in 1878. 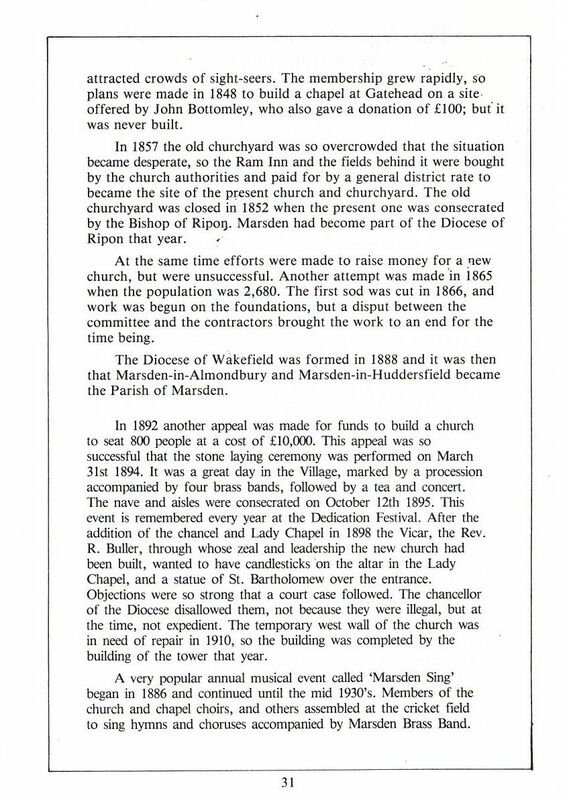 Originally Marsden had two Local Boards, Marsden in Huddersfield and Marsden in Almondbury who held their meetings in the Town School from 1860-1876 before they were moved to the Mechanics Hall. The two boards became one in 1886. The Urban District Council was formed a few years later and held its first elections in 1894. 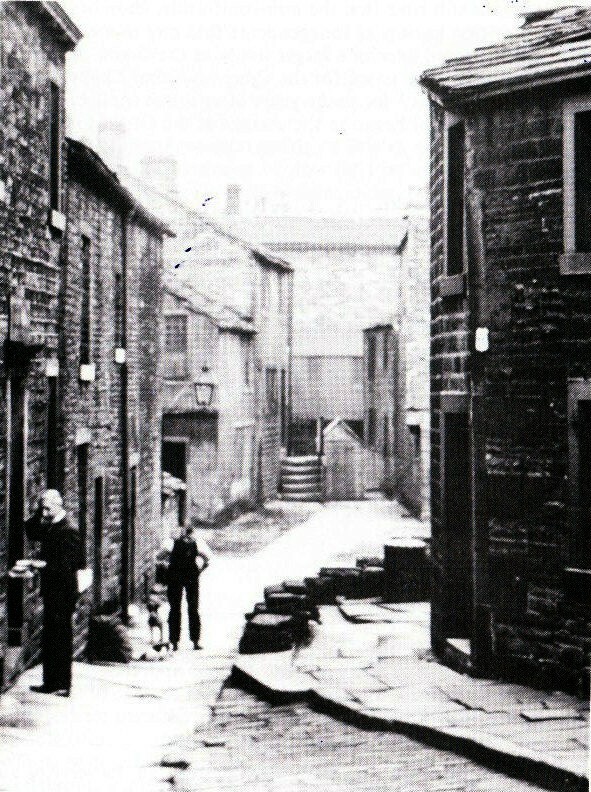 Political parties in Marsden built their first premises during the second half of the 19th century. The Conservative Association first met in a cottage at Reddy Carr in June 1865 and moved to Derby Terrace in 1879. The present club was built in 1908. The Liberal Club was erected in 1874 and enlarged in 1905. The Labour Party first became active in 1891.
attracted crowds of sight-seers. The membership grew rapidly, so plans were made in 1848 to bulld a chapel at Gatehead on a site offered by John Bottomley, who also gave a donation of £100; but it was never built. churchyard was closed tn 1852 when the present one was consecrated by the Bishop of Ripon. Marsden had become part of the Diocese of Ripon that year. At the same time efforts were made to raise money for a new church, but were unsuccessful. Another attempt was made in 1865 when the population was 2,680. 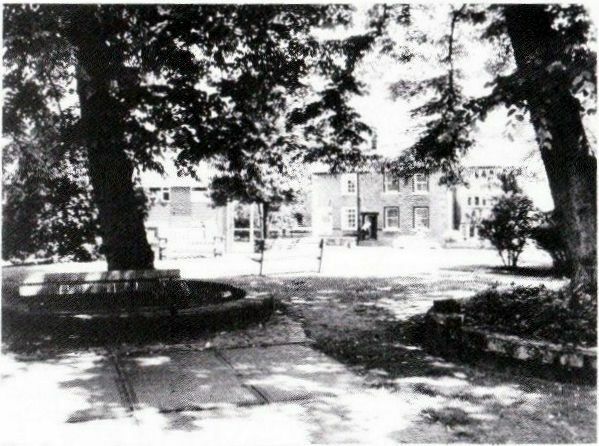 The first sod was cut in 1866 and work was begun on the foundations, but a dispute between the committee and the contractors brought the work to an end for the time being. The Diocese of Wakefield was formed in 1888 and it was then that Marsden-In-Almondbury and Marsden-In-Huddersfield became the Parish of Marsden. of the Diocese disallowed them not because they were illegal but at the time, not expedient. The temporary west wall of the church was tn need of repair in 1910, so the building was completed by the building of the tower that year. 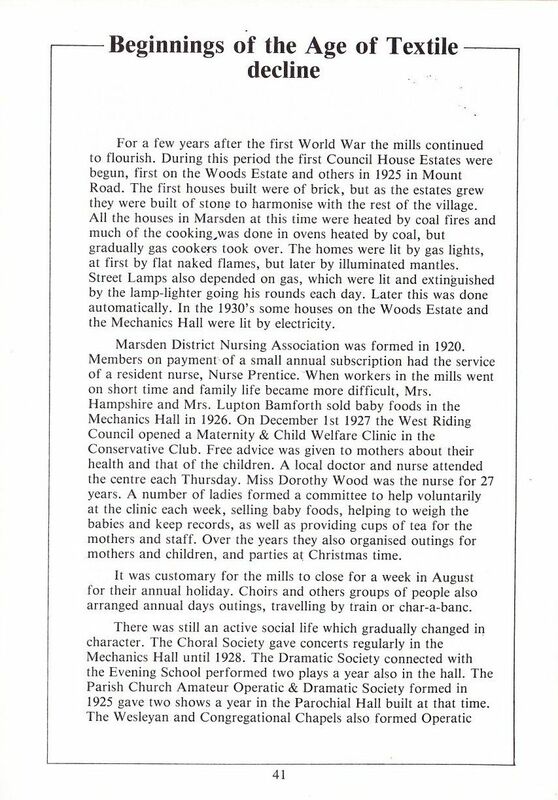 A very popular annual musical event called ‘Marsden Sing’ began in 1886 and continued until the mid 1930’s. Members of the church and chapel choirs, and others assembled at the cricket field to sing hymns and choruses accompanied by Marsden Brass Band. The rise of the woollen industry went along with the development of steam power. The steam was generated in large boilers fired by coal fires constantly stoked by manual labour. The steam turned magnificent engines with large flywheels, immaculately maintained, and generously oiled by the engineers. Holme Mills owned by S, & C. Firth. All these mills manufactured woollen cloth. 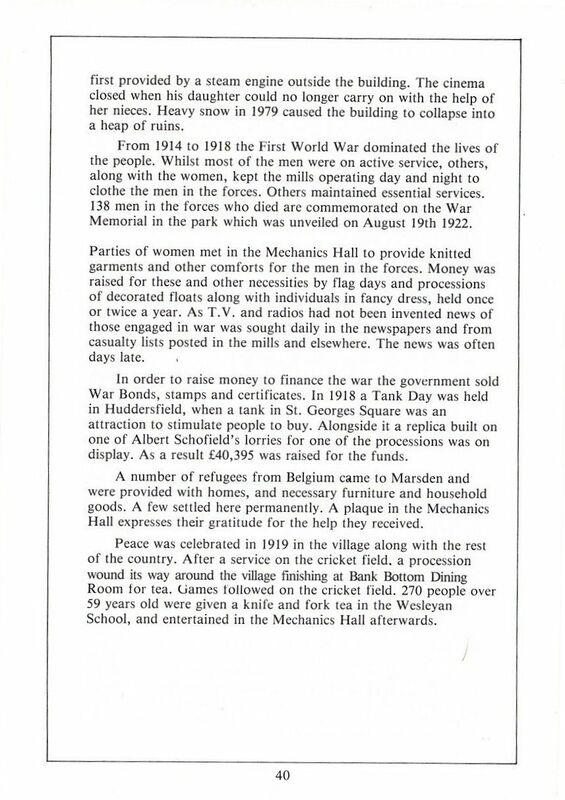 appreciation of the contribution the mill made to the war effort King George V and Queen Mary visited the premises on May 30th 1918, This was the second time the King and Queen had visited Marsden. The first visit was on July 11th 1912.
week in September, namely the first full week after the first Sunday in that month. The other days were two at Christmas, Easter and Whitsuntide. 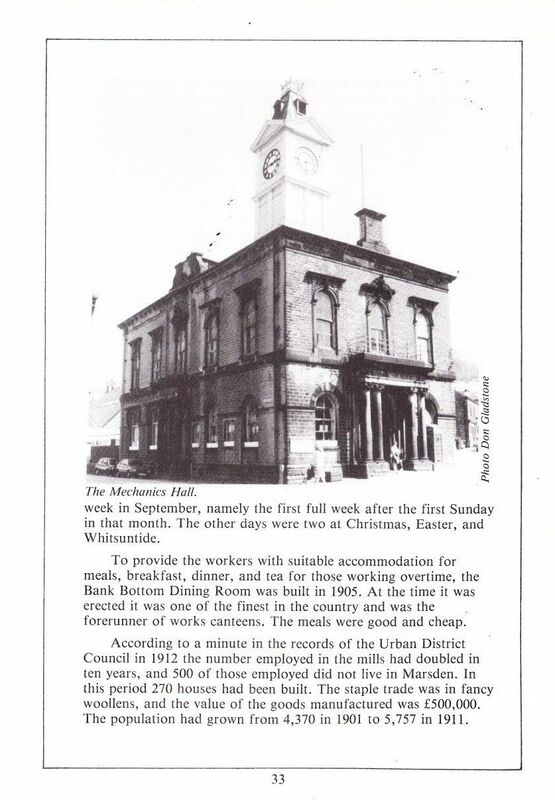 To provide the workers with suitable accommodation for meals, breakfast, dinner, and tea for those working overtime, the Bank Bottom Dining Room was built in 1905, At the time it was erected it was one of the finest in the country and was the forerunner of works canteens. The meals were good and cheap. 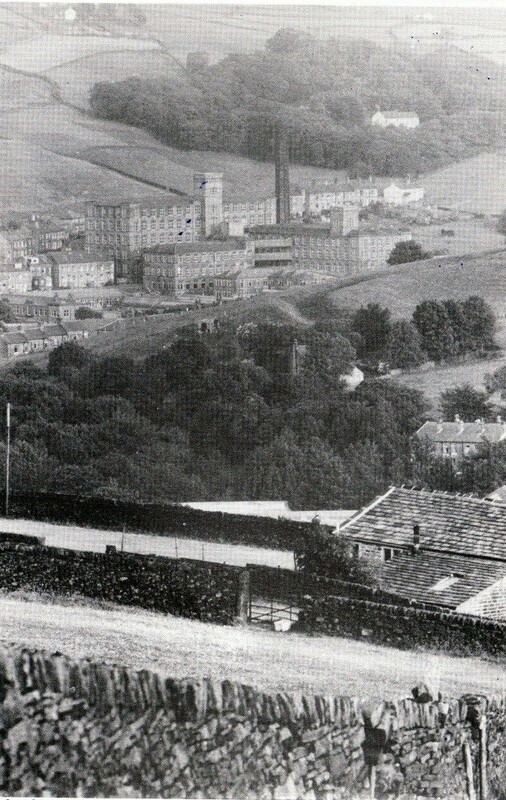 According to a minute in the records of the Urban District Council in 1912 the number employed in the mills had doubled in ten years, and 500 of those employed did not live in Marsden. In this period 270 houses had been built. The staple trade was in fancy woollens, and the value of the goods manufactured was £500,000. The population had grown from 4,370 in 1901 to 5,757 in 1911. To provide homes for the inhabitants rows of houses were built during the last quarter of the nineteenth century and the beginning of the twentieth. The oldest ones, like those at Sandhurst and Brougham Road (some date from 1877) were back-to-back houses, with outdoor tub lavatories. The larger estates at Spring Street, Ottiwells (1907), Wood Top, Grange and Plains were built by the mill owners and let at reasonable rents to the workers. The exception is the long rows of houses on Grange Avenue, which were built by the Co-operative Society. The smaller rows of houses were built by private landlords to let. All these houses had gas lighting and no bathrooms or hot water taps. The kitchen ranges were of cast iron with an open fire in the middle, an oven heated from the fire on one side and a boiler on the other. The mill owners and businessmen lived in the larger houses built separately in their own estates, namely Hey Green, Crow Hill, the Hey, Inner Hey, Cellars Clough, Ing Lees, and Stanley House. The social life was well catered for at this time centering on the Mechanics Hall and the churches. The Glee and Madrigal Society gave concerts including the Messiah. 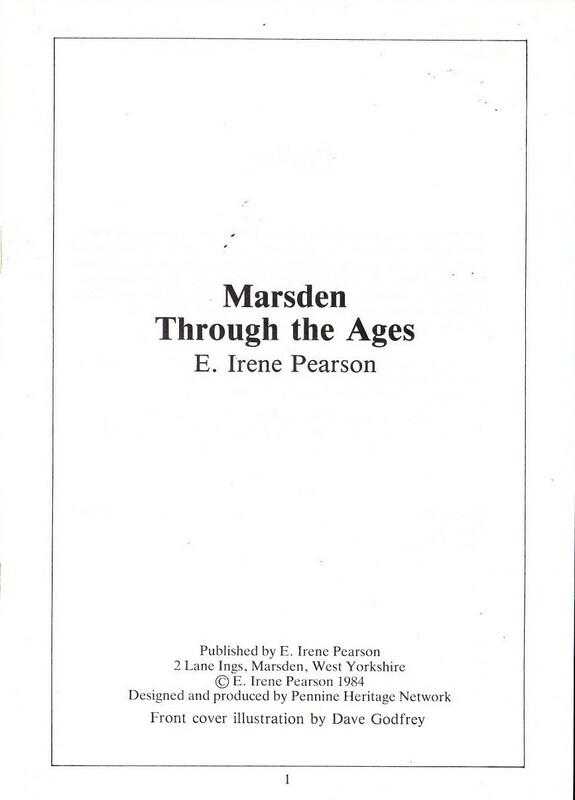 It was succeeded by Marsden Choral Society who gave subscription concerts until 1928. Popular lectures were given in the hall, One of the earliest mentions of the Old Folks Treat was in 1905, on January 27th organised by the Wesleyan Young Mens Bible Class. In addition to those who accepted the invitation 80 teas were sent out. 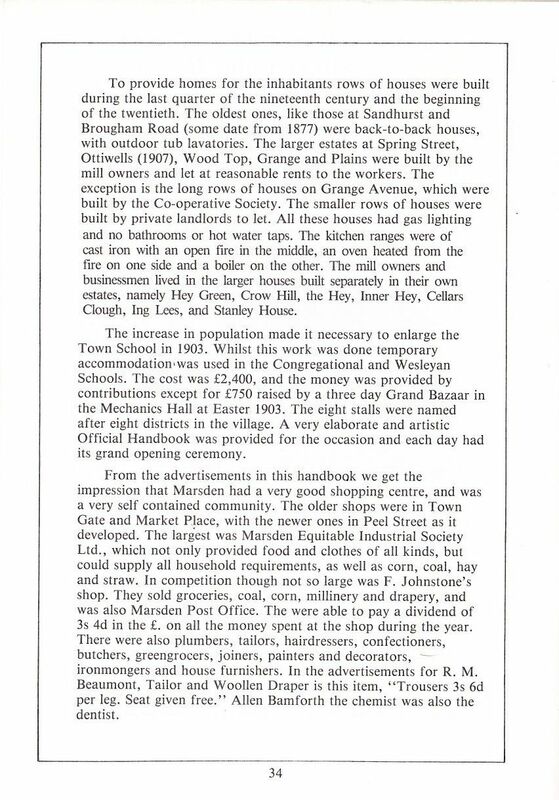 Marsden Floral & Horticultural Society held its first Annual Flower Show in 1905. Two members of the Parish Church Choir became members of Cathedral Choirs. Edgar Dyson became a member of Carlisle Cathedral Choir in 1904. In later years he moved to Gloucester and finally to Salisbury. A year later his brother Sam went to Canterbury, then to the Roman Catholic Cathedral in Westminster. After some time with the choir of Temple Church he became a member of the B.B.C. Singers. 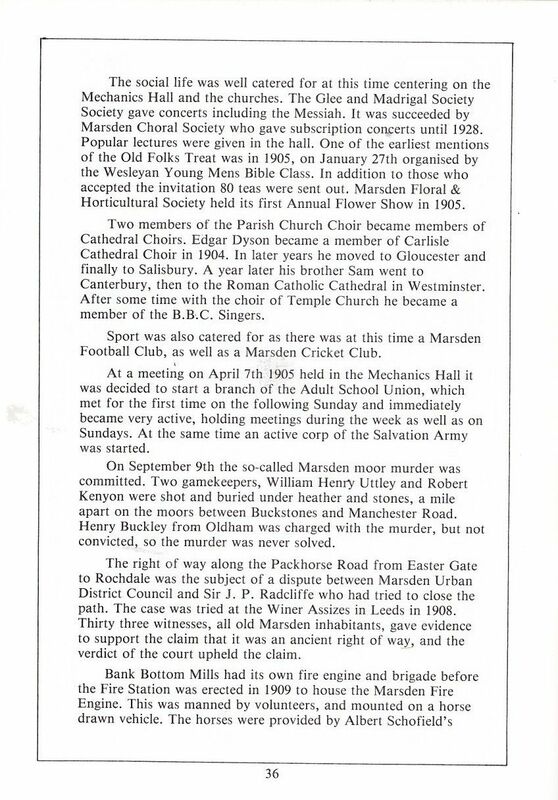 Sport was also catered for as there was at this time a Marsden Football Club, as well as a Marsden Cricket Club. was decided to start a branch of the Adult School Union, which met for the first time on the following Sunday and immediately became very active, holding meetings during the week as well as on Sundays. At the same time an active corp of the Salvation Army was started. On September 9th the so-called Marsden moor murder was committed. Two gamekeepers, William Henry Uttley and Robert Kenyon were shot and buried under heather and stones, a mile apart on the moors between Buckstones and Manchester Road. Henry Buckley from Oldham was charged with the murder, but not convicted, so the murder was never solved. The right of way along the Packhorse Road from Easter Gate to Rochdale was the subject of a dispute between Marsden Urban District Council and Sir J. P. Radcliffe who had tried to close the path. The case was tried at the Winer Assizes in Leeds in 1908. Thirty three witnesses, all old Marsden inhabitants, gave evidence to support the claim that it was an ancient right of way, and the verdict of the court upheld the claim. stables, which were originally behind the Foundry. Steam to operate the pumps was generated by a boiler heated by a coal fire, which had to be lighted as the team set out from the station on hearing the hooter alarm. 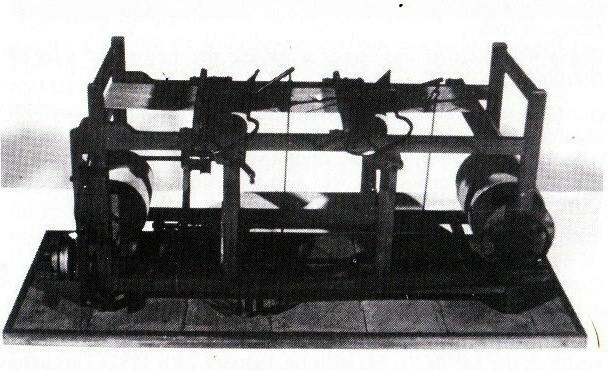 When petrol motors replaced horses the engine was mounted on a motor chassis and driven by one of Albert Schofield’s drivers. 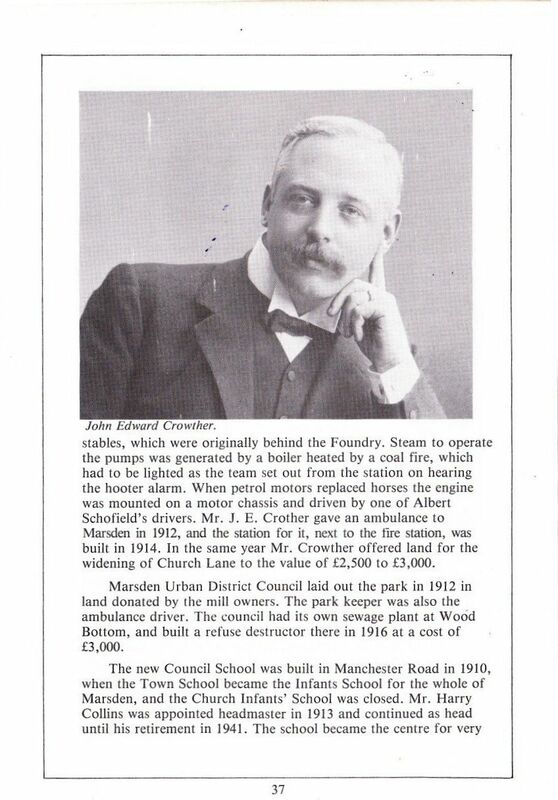 Mr. J. E. Crowther gave an ambulance to Marsden in 1912, and the station for it, next to the fire station, was built in 1914. 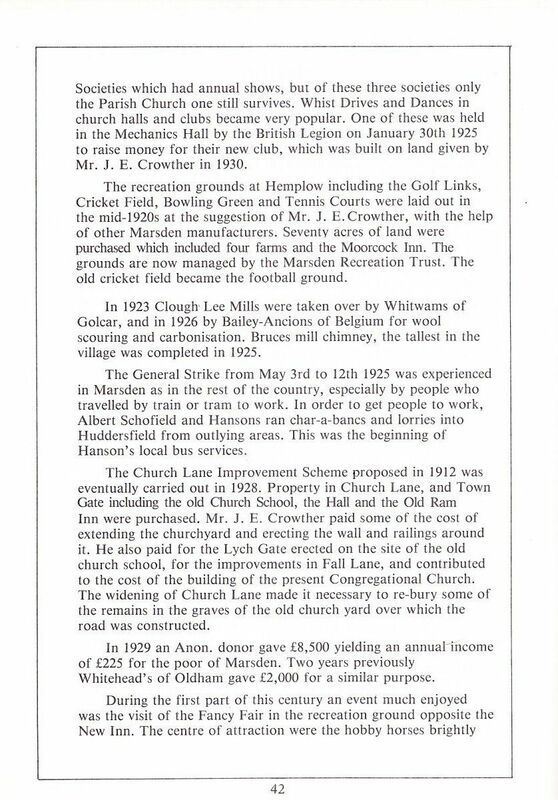 In the same year Mr. Crowther offered land for the widening of Church Lane to the value of £2,500 to £3,000. Marsden Urban District Council laid out the park in 1912 in land donated by the mill owners. The park keeper was also the ambulance driver. 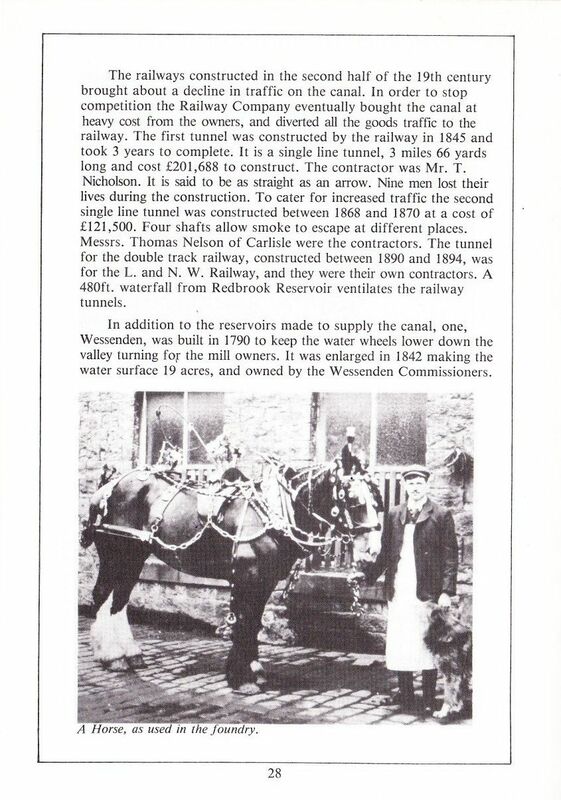 The council had its own sewage plant at Wood bottom, and built a refuse destructor there in 1916 at a cost of £3,000. Other popular events were the three annual cattle fairs still held in April, July and September. Cattle filled the streets in the centre of the village to be bought and sold during the day. In the evenings Town Gate was filled with stalls, lit by naked paraffin lamp flames, at which amusing stall holders auctioned china crockery and pots of all kinds. At other stalls linoleum, carpets and boiled sweets were for sale. In 1914 Huddersfield Passenger Transport brought the first electric trams to Marsden as far as Peel Street thus introducing an alternative way of transport to that of the trains. The journey to Huddersfield took 45 mins. It was possible to send parcels on them to a depot near the terminus and to post letters in boxes hanging at the back of the tram. About 1912 Albert Schofield began to replace his horse drawn vehicles operating from the stables and sheds at Inner Hey by petrol lorries and cars. The lorries had solid rubber tyres and acetylene lamps and as the speed was 12 mph., later increased to 20 mph. the journeys to Liverpool carrying cloth from the mills for export took a whole day to complete the journey. For most of the first half of this century Marsden had its own cinema owned by the Leyland family. 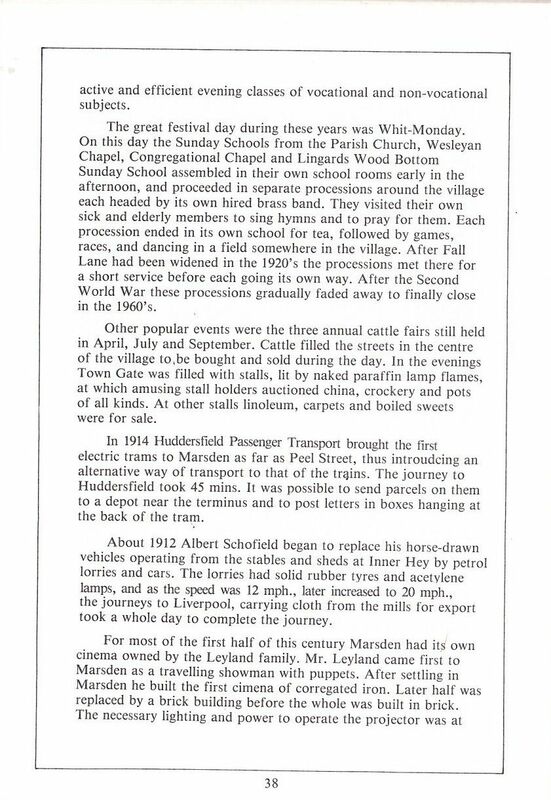 Mr Leyland came first to Marsden as a travelling showman with puppets. After settling in Marsden he built the first cinema of corrugated iron. Later half was replaced by a brick building before the whole was built in brick. Town Gate heading into Church Lane. first provided by a steam engine outside the building. The cinema closed when his daughter could no longer carry on with the help of her nieces. Heavy snow in 1979 caused the building to collapse into a heap of ruins. From 1914 to 1918 the First World War dominated the lives of the people. Whilst most of the men were on active service others along with the women kept the mills operating day and night to clothe the men in the forces. Others maintained essential services. 138 men in the forces who died are commemorated on the War Memorial in the park which was unveiled on August 19th 1922. Parties of women met in the Mechanics Hall to provide knitted garments and other comforts for the men in the forces. Money was raised for these and other necessities by flag days and processions of decorated floats along with individuals in fancy dress, held once or twice a year. As T.V. and radios had not been invented news of those engaged in war was sought daily in the newspapers and from casualty lists posted in the mills and elsewhere. The news was often days late. In order to raise money to finance the war the government sold War Bonds, stamps and certificates. In 1918 a Tank Day was held in Huddersfield, when a tank in St Georges Square was an attraction to stimulate people to buy. Alongside it a replica built on one of Albert Schofield’s lorries for one of the processions was on display. As a result £40,395 was raised for the funds. A number of refugees from Belgium came to Marsden and were provided with homes and necessary furniture and household goods. A few settled here permanently. A plaque in the Mechanics Hall expresses their gratitude for the help they received. Peace was celebrated in 1919 in the village along with the rest of the country. After a service on the cricket field a procession wound its way around the village finishing at Bank Bottom Dining Room for tea. Games followed on the cricket field. 270 people over 59 years old were given a knife and fork tea in the Wesleyan School and entertained in the Mechanics Hall afterwards. they were built of stone to harmonise with the rest of the village. 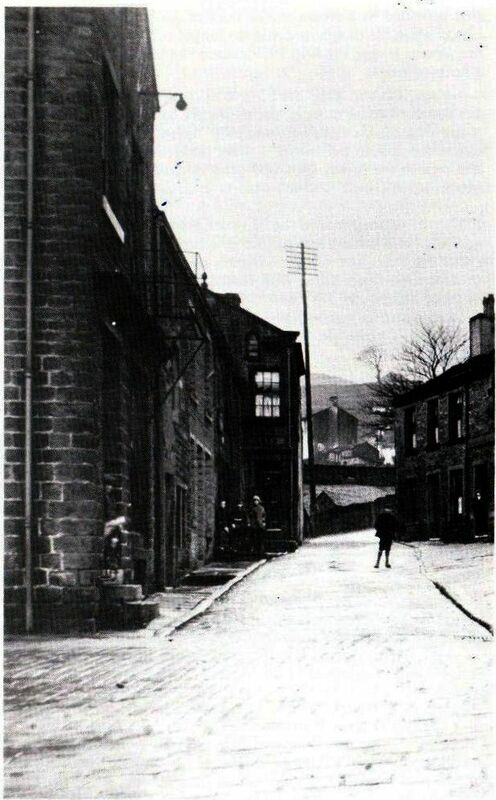 All the houses in Marsden at this time were heated by coal fires and much of the cooking was done in ovens heated by coal, but gradually gas cookers took over. The homes were lit by gas lights, at first by flat naked flames, but later by illuminated mantles. Street Lamps also depended on gas, which were lit and extinguished by the lamp-lighter going his rounds each day. Later this was done automatically. In the 1930’s some houses on the Woods Estate and the Mechanics Hall were lit by electricity. at the clinic each week, selling baby foods, helping to weigh the babies and keep records, as well as providing cups of tea for the mothers and staff . Over the years they also organised outings for mothers and children, and parties at Christmas time. It was customary for the mills to close for a week in August for their annual holiday. Choirs and others groups of people also arranged annual days outings, traveling by train or char-a-banc. to raise money for their new club, which was built on land given by Mr. J. E. Crowther in 1930. The recreation grounds at Hemplow including the Golf Links, Cricket Field, Bowling Green and Tennis Courts were laid out in the mid-1920s at the suggestion of Mr. J. E.Crowther, with the help of other Marsden manufacturers. Seventv acres of land were purchased which included four farms and the Moorcock Inn. The old cricket field became the football ground. 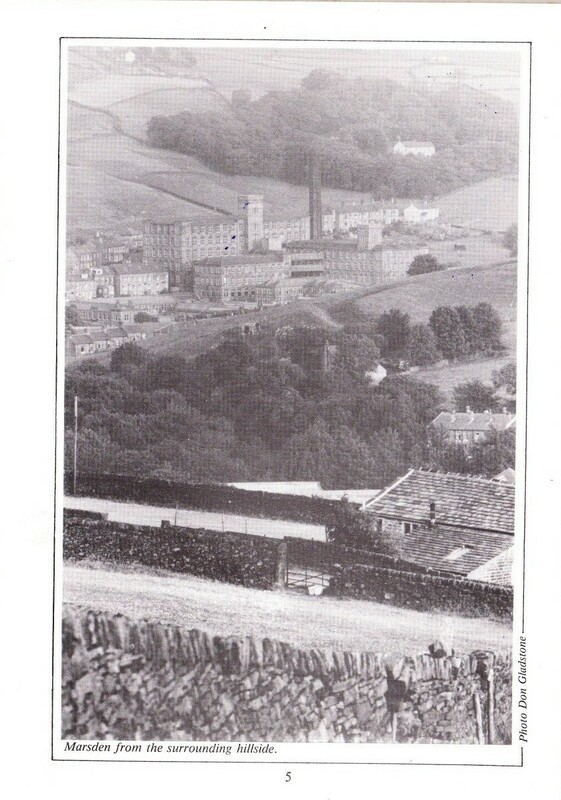 In 1923 Clough Lee Mills were taken over by Whitwams of Golcar, and in 1926 by Bailey-Ancions of Belgium for wool scouring and carbonisation. Bruces mill chimney, the tallest in the village was completed in 1925. The General Strike from May 3rd to 12th 1925 was experienced in Marsden as in the rest of the country, especially by people who travelled by train or tram to work. In order to get people to work Albert Schofield and Hansons ran char-a-bancs and lorries into Huddersfield from outlying areas. This was the beginning of Hanson’s local bus services. The Church Lane Improvement Scheme proposed in 1912 was eventually carried out in 1928. Property in Church Lane, and Town Gate including the old Church School, the Hall and the Old Ram Inn were purchased. Mr. J. E. Crowther paid some of the cost of extending the churchyard and erecting the wall and railings around it. 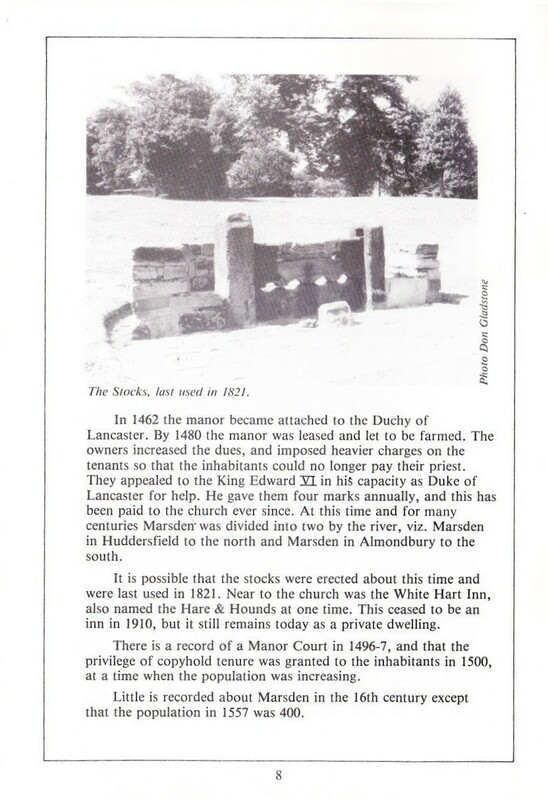 He also paid for the Lych Gate erected on the site of the old church school, for the improvements in Fall Lane, and contributed to the cost of the building of the present Congregational Church. The widening of Church Lane made it necessary to re-bury some of the remains in the graves of the old church yard over which the road was constructed. In 1929 an Anon. donor gave £8,500 yielding an annual income of £225 for the poor of Marsden. Two years previously Whitehead’s of Oldham gave £2,000 for a similar purpose. lit with a magnificent organ shining brass and powered by a steam engine. Other attractions were swings, coconut shies, shooting alleys and hooplah stalls. The schools in Marsden were reorganised in 1930 when the National School became the Junior School and the Council School the Marsden Senior School. In the following year the Boys Brass Band was formed for the pupils at the Senior School with Mr Tom Eastwood as teacher and conductor. From April 11th to June 23rd 1930 all the woollen mills in the area were on strike as a result of a wages dispute. This caused hardship to families, so on June 6th the British Legion opened a soup kitchen and catered for 100-130 children of ex service men. This was during the depression which went on well into the 1930’s. The mills continued to work full time long after the slump set in until the warehouses were full. They produced woollen cloth at a price and value very few competing firms could equal or surpass. The slump was due to cheap shoddy cloth and badly made clothes from the continent. 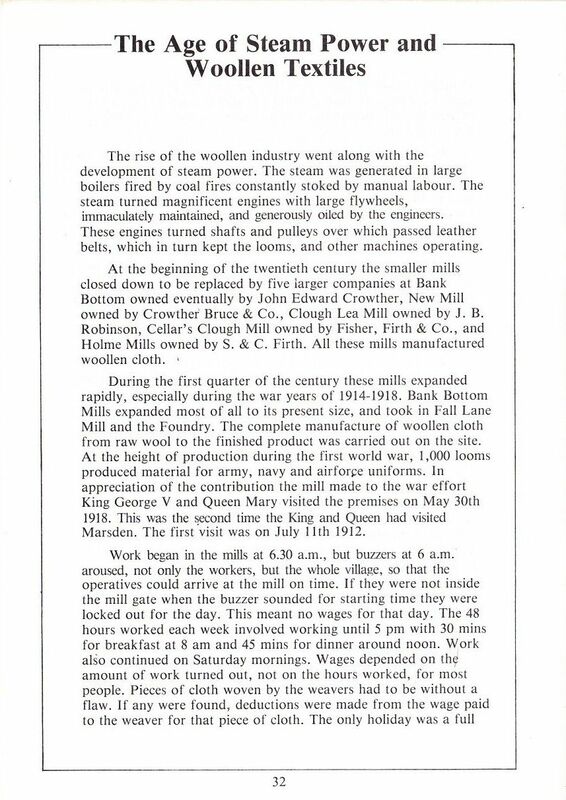 This meant the mills went on short time from June 19th 1931 working a six hour day instead of 8 hours. his work people going on short time. He was always a constant friend of the poor, no one was allowed to suffer from want, even families of workers concerned in industrial disputes were helped quietly and without publicity. In addition to the gifts to Marsden already mentioned he had helped to maintain a curate at the Parish Church and had augmented the living and given the tenor bell when the peal of bells was installed in the tower. When he was cremated at Lawnswood on July 8th the mills closed, flags flew at half mast on the mills and other buildings and the shops closed and drew their blinds. Between February 1929 and July 1931 five of the manufacturers in Marsden had died namely Arthur Robinson, Samuel Firth, Cooper Firth, E. J. Bruce and J. E. Crowther. Marsden people enjoyed themselves celebrating the jubilee of King George V on May 6th 1935. After a service in church a procession toured the village led by the Brass Band. Prizes were given for fancy dress and after tea a gala was held in Cellars Clough Park. Children were presented with mugs and old people over 70 given half pound caskets of tea. A bonfire was built in the evening at Scout. One of the oldest groups of houses disappeared when Planks were demolished in 1935. 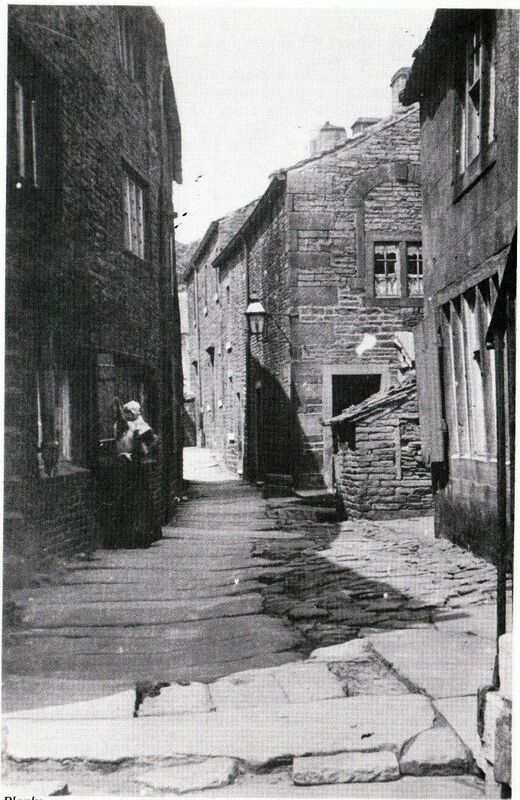 This group of old stone houses had two narrow stone flagged lanes between the houses one was called Golden Alley. Underneath the flags flowed a stream. It would have been possible to shake hands from an upstairs room on one side of the lane with one on the other. These streets could have featured in Charles Dicken’s novels. 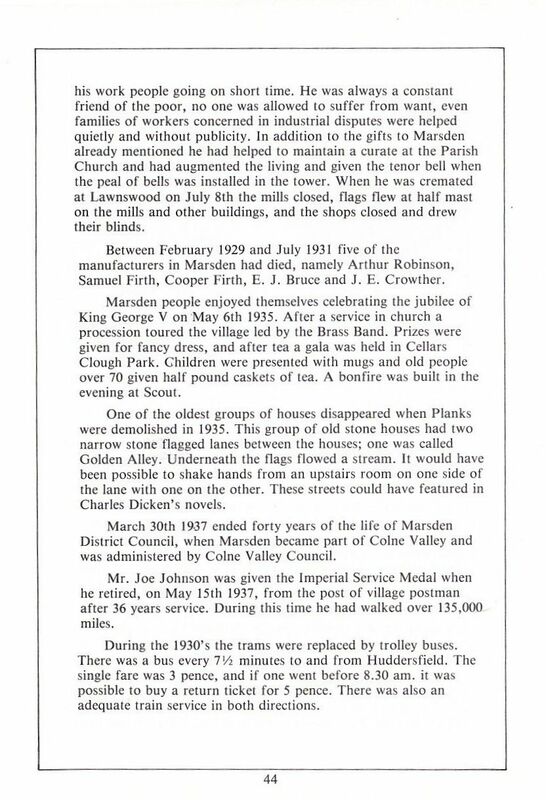 March 30th 1937 ended forty years of the life of Marsden District Council when Marsden became part of Colne Valley and was administered by Colne Valley Council. Mr. Joe Johnson was given the Imperial Service Medal when he retired on May 15th 1937 from the post of village postman after 36 years service. During this time he had walked over 135,000 miles. During the 1930’s the trams were replaced by trolley buses. There was a bus every 7 ½ minutes to and from Huddersfield. The single fare was 3 pence and if one went before 8:30am it was possible to buy a return ticket for 5 pence. There was also an adequate train service in both directions. unemployment, and dole queues, as well as the cessation of most social gatherings and events. All street lights were extinguished, bus windows were painted blue and lights became amber in colour. All house windows were blacked out, and it became an offence to show the tiniest chink of light. Only public buildings which could be completely blacked out could be used for concerts and other social activities. Church bells were silenced and only to be rung if the enemy invaded the country. To go about the streets after dark people carried torches with a very small aperture. Everyone carried a gas mask, was issued with an identity card and number together, with a book of coupons to be used to obtain food, clothing and all commodities which in due course were rationed. Most of the younger generations, both men and women were called to National Service in the armed forces Pioneer Corp, Women s Land Army or in hospital service. The only people left in the village were those in essential services or working in necessary jobs in mills and factories as well as the old and infirm. Volunteers were asked for to join the Auxillary Fire Service, to become Air Raid Wardens, to man first aid posts or join the Women’s Voluntary Service. As the war progressed men were required for the Local Volunteer Reserve, later known as the Home Guard, who were intended to tackle any parachutists who might be dropped in the area. When incendiary bombs were used most able bodied people were expected to take part in fire watching duties throughout the night at the place where they worked, or on public buildings. 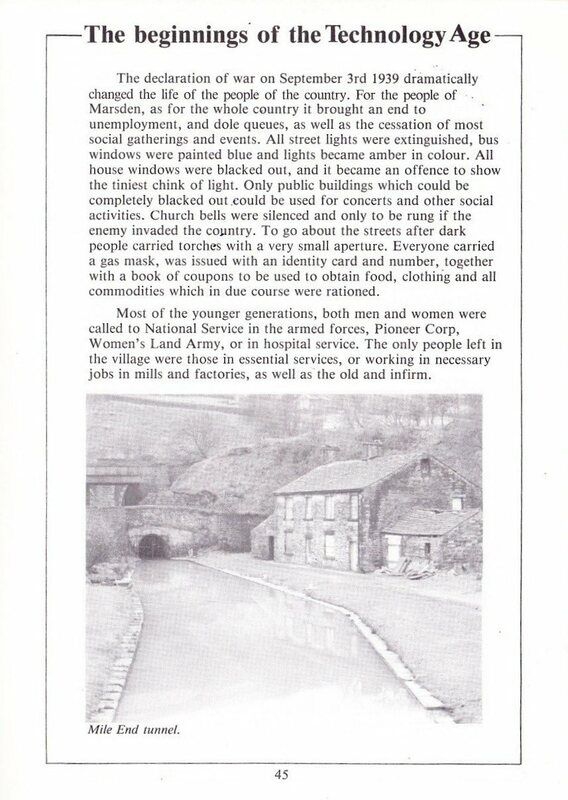 Before war was declared soldiers arrived in Marsden and were stationed in the canal warehouse at Tunnel End, for the purpose of guarding the tunnel and fourth shaft. 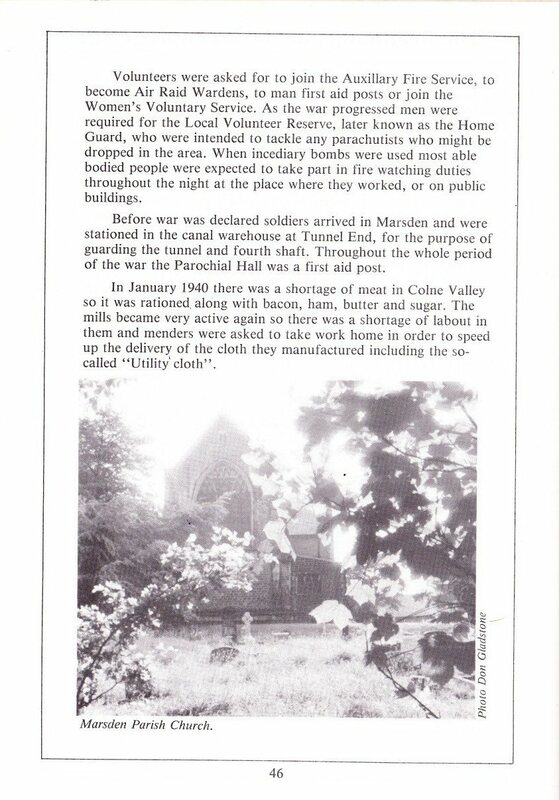 Throughout the whole period of the war the Parochial Hall was a first aid post. In January 1940 there was a shortage of meat in Colne Valley so it was rationed along with bacon, ham, butter and sugar. 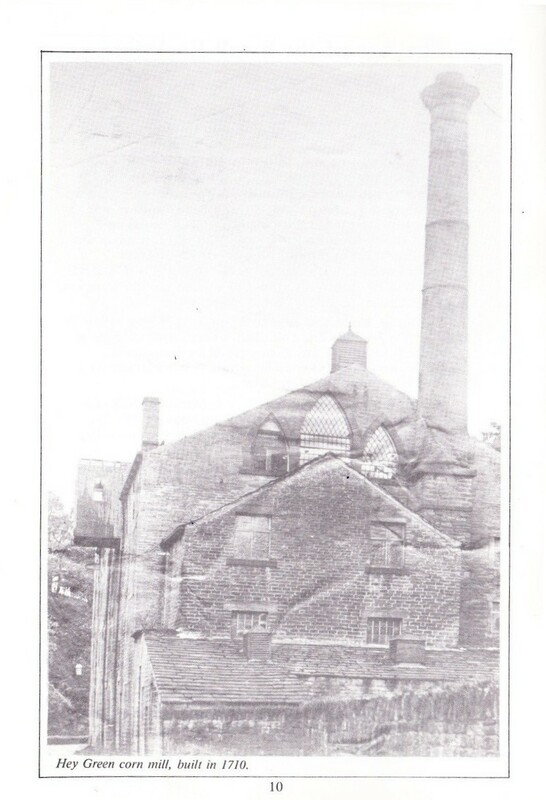 The mills became very active again so there was a shortage of labour in them and menders were asked to take work home in order to speed up the delivery of the cloth they manufactured including the so called Utility cloth. Marsden Parish Church. Photo Don Gladstone. Although not due to the war life in the lnfant’s School changed slightly when Miss Lucy Firth retired on January 31st 1940 after being at the school for 40 years, and being headmistress for most of the time. She first joined the staff in 1899 as an uncertificated assistant teacher. Miss Firth’s training as a teacher followed the usual course for many teachers at the beginning of the century, After a period acting as a monitor at the school they became pupil teachers, and went to classes in the evening and on Saturdays at Huddersfield Technical College, studying subjects which enabled them to obtain their teachers certificates thus enabling them to become qualified teachers. The Council School experienced a bigger change when Mr. Harry Collins retired after being head of the school from 1913 to 1940. The school then became a Secondary Modern School with Mr. J. E. Glover as headmaster. children were able to get to school. Newspapers, meat and milk failed to arrive. 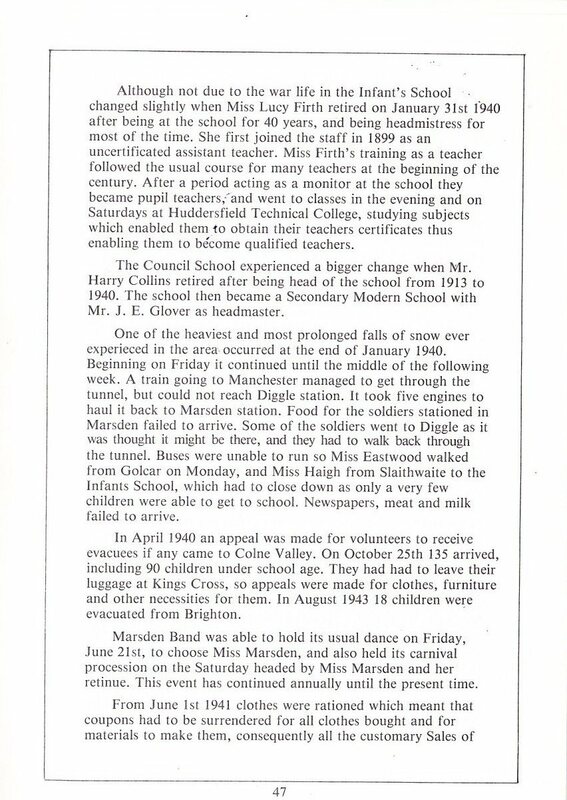 In April 1940 an appeal was made for volunteers to receive evacuees if any came to Colne Valley. On October 25th 135 arrived, including 90 children under school age. They had had to leave their luggage at Kings Cross, so appeals were made for clothes, furniture and other necessities for them. In August 1943 18 children were evacuated from Brighton. Marsden Band was able to hold its usual dance on Friday, June 21st, to choose Miss Marsden, and also held its carnival procession on the Saturday headed by Miss Marsden and her retinue. This event has continued annually until the present time. Work had to be suspended. In due course coal was rationed so that in March 1944 the allowance was only 5 cwts per month. Coke supplies were also restricted. On September 3rd 1942 the mills stopped work at 11 am for 15 mins. so all the employees could take part in a service broadcast in connection with a National Day of Prayer. Although air raid alarms occurred occasionally few bombs were dropped in the area. It is reported that one dropped in Wessenden on October 14th 1940. Throughout the war period people were debarred from walking over the moors by Cupworth reservoir as this was used as a decoy to lure attackers from the towns. When in 1944 flying bombs became the chief missiles more evacuees arrived from London. A few of these families who came to Marsden at this time settled in the village after the war. As the war began to approach its end on September 17th 1944 life became more normal when blackouts became dim outs and Fire Civil Defence and Home Guard duties came to an end. All blackouts and dimouts ended completely on April 23rd 1945. 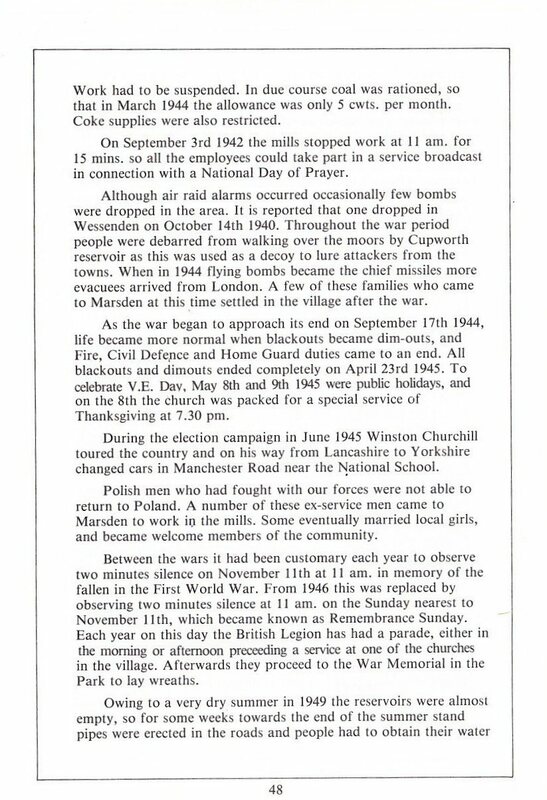 To celebrate V E Day May 8th and 9th 1945 were public holidays, and on the 8th the church was packed for a special service of Thanksgiving at 7:30 pm. During the election campaign in June 1945 Winston Churchill toured the country and on his way from Lancashire to Yorkshire changed cars in Manchester Road near the National School. Polish men who had fought with our forces were not able to return to Poland. A number of these ex service men came to Marsden to work in the mills. Some eventually married local girls and became welcome members of the community. Between the wars it had been customary each year to observe two minutes silence on November 11th at 11am in memory of the fallen in the First World War. From 1946 this was replaced by observing two minutes silence at 11am on the Sunday nearest to November 11th which became known as Remembrance Sunday. Each year on this day the British Legion has had a parade, either in the morning or afternoon preceding a service at one of the churches in the village. Afterwards they proceed to the War Memorial in the Park to lay wreaths. from them unless they had access to spring water. In 1949 Mr. Sam Whitehead paid for the construction of Rose Hill Gardens on a triangular piece of a field left after houses had been built in Rose Hill. Mr. Harry Whitehead retired on August 31st 1949 after being headmaster of the National School for 29 years. The second housing estate to be built in the village was constructed at Dirker in the 1940’s. These houses were all semi-detached and built of stone with red tiled roofs. As the estate expanded the houses were built of brick in short rows to harmonise with the surrounding area. The third housing estate was built at Netherley about 1957. Although the war ended in 1945 it was ten more years before restrictions ended enabling people to enjoy life more freely. Petrol ceased to be rationed in 1950, tea in 1952, and finally butter and meat in 1954. 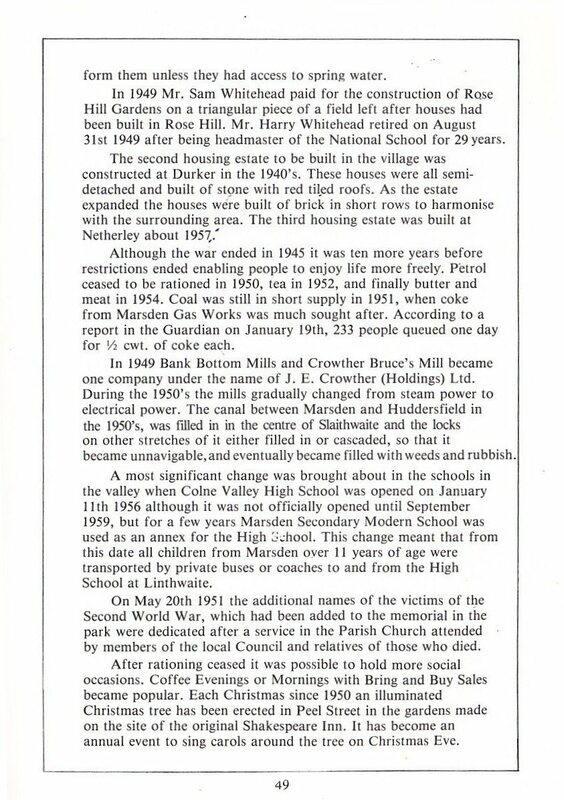 Coal was still in short supply in 1951, when coke from Marsden Gas Works was much sought after. According to a report in the Guardian on January 19th, 233 people queued one day for 1/2 cwt, of coke each. In 1949 Bank Bottom Mills and Crowther Bruce’s Mill became one company under the name of J, E. Crowther (Holdings) Ltd. During the 1950’s the mills gradually changed from steam power to electrical power, The canal between Marsden and Huddersfield in the 1950’s, was filled in in the centre of Slaithwaite and the locks on other stretches of it either filled in or cascaded, so that it became unnavigable, and eventually became filled with weeds and rubbish. A most significant change was brought about in the schools in the valley when Colne Valley High School was opened on January 11th 1956 although it was not officially opened until September 1959, but for a few years Marsden Secondary Modern School was used as an annex for the High School. This change meant that from this date all children from Marsden over 11 years of age were transported by private buses or coaches to and from the High School at Linthwaite. On May 20th 1951 the additional names of the victims of the Second World War, which had been added to the memorial in the park were dedicated after a service in the Parish Church attended by members of the local Council and relatives of those who died. After rationing ceased it was possible to hold more social occasions. Coffee Evenings or Mornings with Bring and Buy Sales became popular. Each Christmas since 1950 an illuminated Christmas tree has been erected in Peel Street in the gardens made on the site of the original Shakespeare Inn. It has become an annual event to sing carols around the tree on Christmas Eve. At the beginning of the 1960’s the mills were still active but changes began to take place when on January 30th 1961 the working week was reduced to 42 hours. Each day began at 7.15 am. and ended at 4.30 pm. Crowther’s mills still employed a fairly large workforce, so that 1,000 of their employees went on a trip to Blackpool to celebrate David Crowther’s wedding. Each employee was give £2 to spend and a day’s wages. 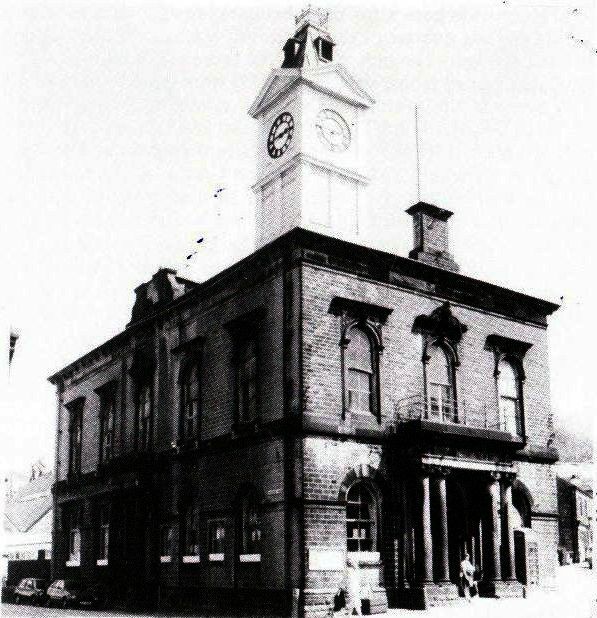 The Council School became Marsden Junior School in 1960 when the National School was closed and was demolished in 1967. Hard End were inaugurated, but the frequency was reduced from a 15 mins. to a 20 mins. service. For a few years the Infants School used some of the Wesleyan School rooms for school dinners and as an extra classroom, but after the members of the church had spent a considerable amount of money on repairing the roof it was declared unsafe and closed, to be finally demolished in 1967. Consequently on September 3rd 1967 the Wesleyan and Congregational Churches formally united to become the United Church. 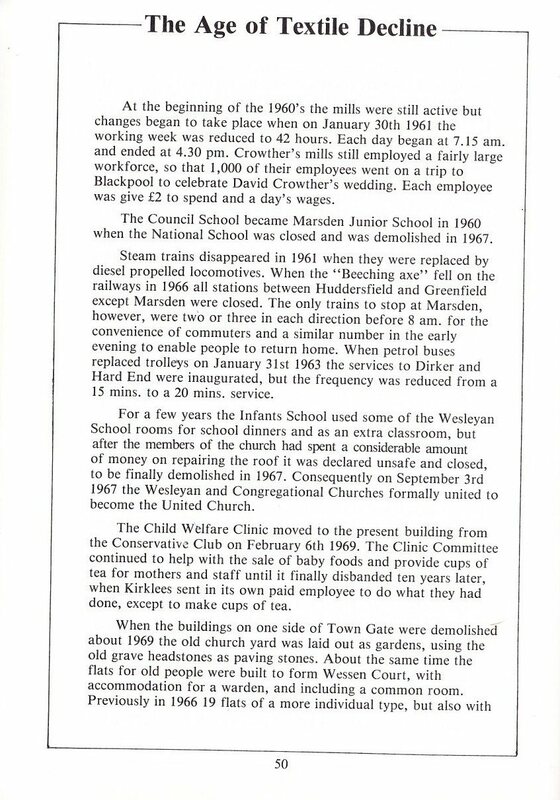 The Child Welfare Clinic moved to the present building from the Conservative Club on February 6th 1969. The Clinic Committee continued to help with the sale of baby foods and provide cups of tea for mothers and staff until it finally disbanded ten years later, when Kirklees sent in its own paid employee to do what they had done, except to make cups of tea. 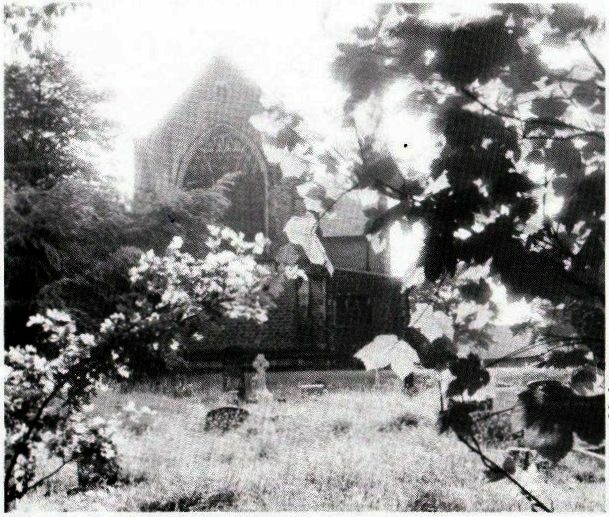 When the buildings on one side of Town Gale were demolished about 1969 the old church yard was laid out as gardens, using the old grave headstones as paving stones. About the same time the flats for old people were built to form Wessen Court, with accommodation for a warden, and including a common room. a warden on the site, were built in Carrs Road. Earlier still Woods Estate had included bungalows for old people. A campaign was launched in 1969 in an attempt to clean up the country. Marsden formed its own Clean-Up Campaign Committee, which was active for a few years. Volunteers cleaned out the rubbish from the river, and others planted bulbs in various locations. At the same time Colne Valley Tree Society planted trees in one of two areas. Gardens on the site of the old churchyard. Photo Don Gladstone. 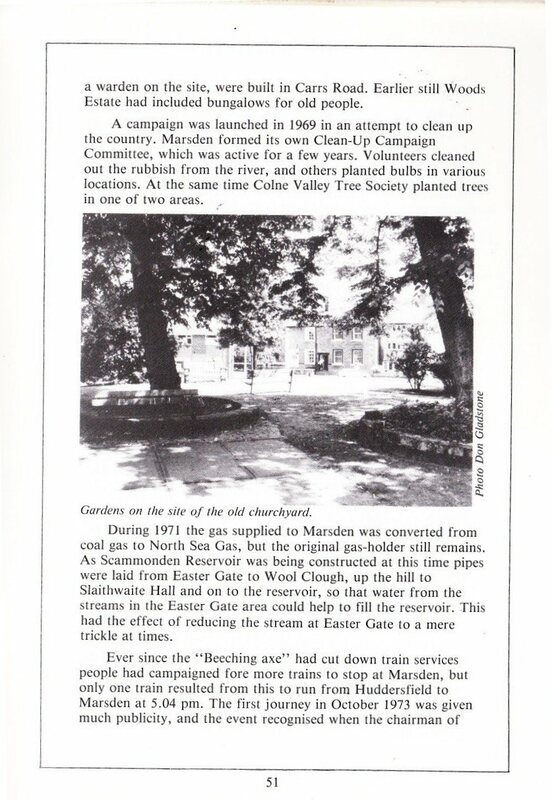 During 1971 the gas supplied to Marsden was converted from coal gas to North Sea Gas, but the original gas-holder still remains. As Scammonden Reservoir was being constructed at this time pipes were laid from Easter Gate to Wool Clough, up the hill to Slaithwaite Hall and on to the reservoir, so that water from the streams in the Easter Gate area could help to fill the reservoir, This had the effect of reducing the stream at Easter Gate to a mere trickle at times. Colne Valley Council Mr Clark the M P for Colne Valley and Mr Richard Wainwright were amongst the passengers. The following year a “Shoppers Train” to Manchester was introduced on Tuesday mornings with a return train in the afternoon. cared for. More recently some other rooms have been redecorated and brought into use. The textile mills gradually declined during this decade affecting Crowther’s mills considerably. The mill always known as Bruce’s mill ceased to make cloth and began producing carpet yarn in 1975. Bank Bottom mills closed down, when many of their employees became redundant. The only processes to remain in operation were yarn spinning and dyeing. At this time they opened their mill shop to enable them to sell off surplus cloth. Mrs Philip Crowther who had been head of the firm for many years since her husband’s death died on December 5th 1975. For the funeral service at Lindley on December 9th a bus was provided to take past and present employees to the church if they wished to attend the service. 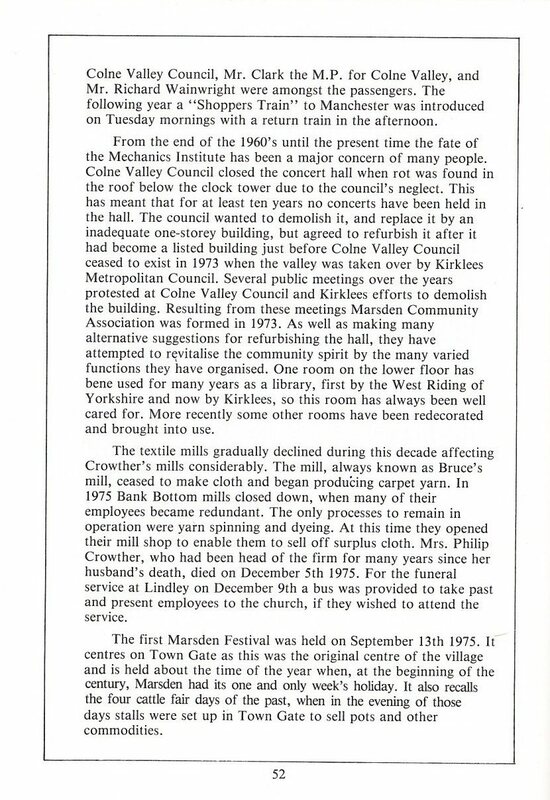 The first Marsden Festival was held on September 13th 1975 It centres on Town Gate as this was the original centre of the village and is held about the time of the year when at the beginning of the century Marsden had its one and only week’s holiday. It also recalls the four cattle fair days of the past when in the evening of those days stalls were set up in Town Gate to sell pots and other commodities. 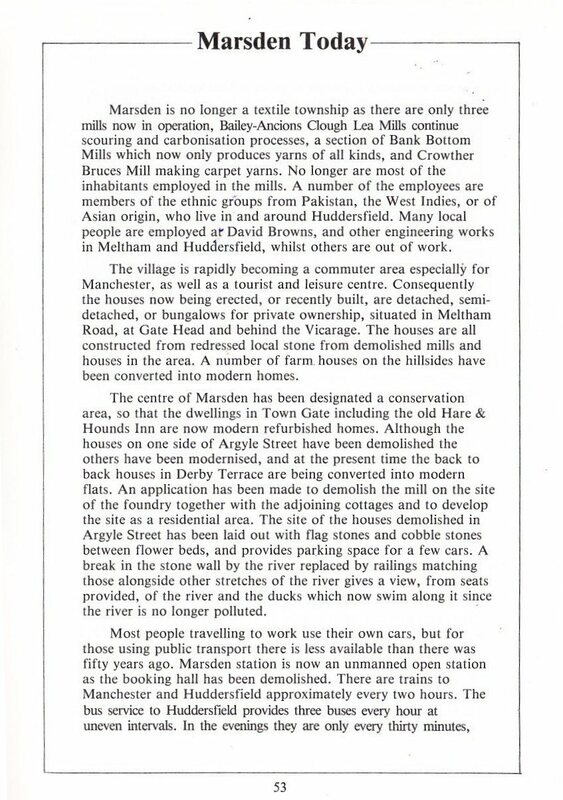 Marsden is no longer a textile township as there are only three mills now in operation, Bailey-Ancions Clough Lea Mills continue scouring and carbonisation processes, a section of Bank Bottom Mills which now only produces yarns of all kinds, and Crowther Bruces Mill making carpet yarns. No longer are most of the inhabitants employed in the mills. A number of the employees are members of the ethnic groups from Pakistan, the West Indies, or of Asian origin, who live in and around Huddersfield. Many local people are employed at David Browns, and other engineering works in Meltham and Huddersfield, whilst others are out of work. Road, at Gate Head and behind the Vicarage. The houses are all constructed from redressed local stone from demolished mills and houses in the area. A number of farm houses on the hillsides have been converted into modern homes. The centre of Marsden has been designated a conservation area, so that the dwellings in Town Gate including the old Hare & Hounds Inn are now modern refurbished homes. Although the houses on one side of Argyle Street have been demolished the others have been modernised, and at the present time the back to back houses in Derby Terrace are being converted into modern flats. An application has been made to demolish the mill on the site of the foundry together with the adjoining cottages and to develop the site as a residential area. The site of the houses demolished in Argyle Street has been laid out with flag stones and cobble stones between flower beds, and provides parking space for a few cars. A break in the stone wall by the river replaced by railings matching those alongside other stretches of the river gives a view, from seats provided, of the river and the ducks which now swim along it since the river is no longer polluted. so visits to concerts and other meetings in Huddersfield in the evenings have become a thing of the past for some people. The single fare to Huddersfield is 60p unless one can travel at off peak periods or take advantage of slightly cheaper fares available to regular travellers and senior citizens. The older people in the community are well cared for in the housing provided for them by health visitors and home helps. Volunteers also provide a meals on wheels service whilst some enjoy a meal provided once a week in the Mechanics Hall. Many of the senior citizens who form the Good Companions meet every Friday in the United Church Schoolroom for social activities and go on outings and holidays together. Others meet in the Mechanics at the middle of the week. There are also many opportunities for young people to meet together. The Youth Club has premises in an old mill at Lake Side, and at the present time is being converted by voluntary effort into a Sports Hall. There are also companies of Scouts, Girl Guides and Brownies and within the last two years a company of Majorettes has formed.There is also a Junior Band. For those who enjoy sport there are plenty of opportunities. Marsden has a Cricket Club, Football Club, Golf Club and a Sailing Club which uses Redbrook Reservoir. Recently the Tennis Club has been reformed at Hemplow and there is a tennis court in the park. The most popular sport, especially for retired men and women is bowling on the green in the park. 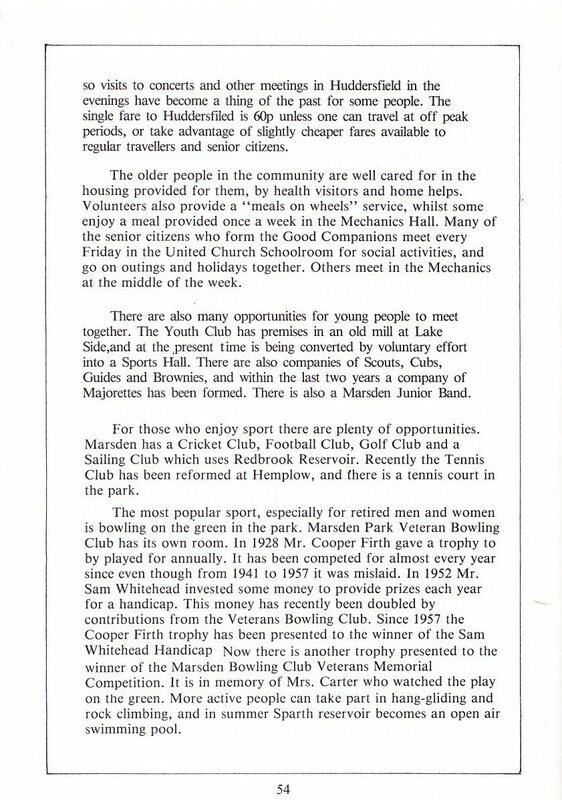 Marsden Park Veteran Bowling Club has its own room. ln 1928 Mr Cooper Firth gave a trophy to be played for annually. lt has been competed for almost every year since even though from 1941 to 1957 it was mislaid. ln 1952 Mr Sam Whitehead invested some money to provide prizes each year for a handicap. This money has recently been doubled by contributions from the Veterans Bowling Club. Since 1957 the Cooper Firth trophy has been presented to the winner of the Sam Whitehead Handicap. Now there is another trophy presented to the winner of the Marsden Bowling Club Veterans Memorial Competition. lt is in memory of Mrs Carter who watched the play on the green. More active people can take part in hang gliding and rock climbing and in summer Sparth reservoir becomes an open air swimming pool. The Huddersfield Canal. Photo Don Gladstone. 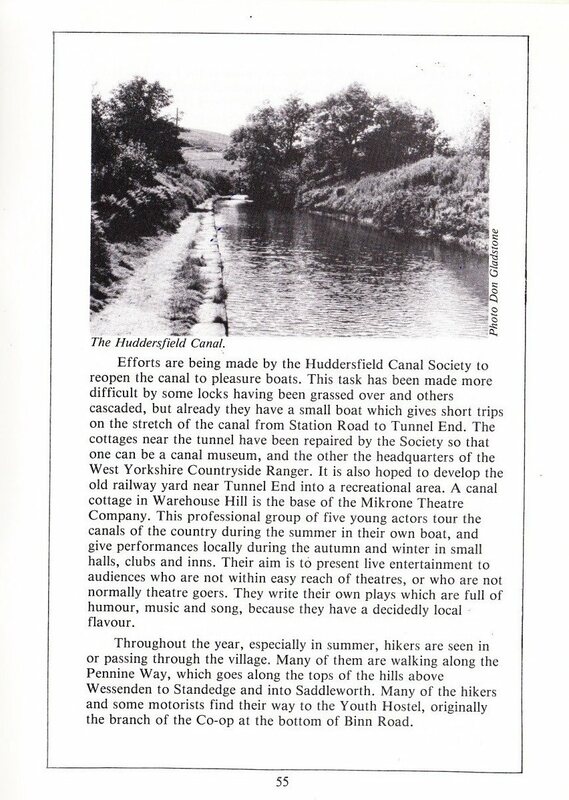 Efforts are being made by the Huddersfield Canal Society to reopen the canal to pleasure boats. This task has been made more difficult by some locks having been grassed over and others cascaded, but already they have a small boat which gives short trips on the stretch of the canal from Station Road to Tunnel End. 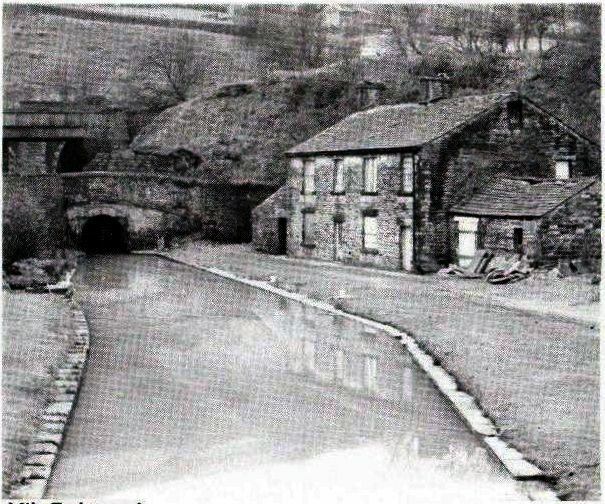 The cottages near the tunnel have been repaired by the Society so that one can be a canal museum, and the other the headquarters of the West Yorkshire Countryside Ranger. lt is also hoped to develop the old railway yard near Tunnel End into a recreational area. A canal cottage in Warehouse Hill is the base of the Mikron Theatre Company. This professional group of five young actors tour the canals of the country during the summer in their own boat, and give performances locally during the autumn and winter in small halls, clubs and inns. Their aim is to present live entertainment to audiences who are not within easy reach of theatres, or who are not normally theatre goers. They write their own plays which are full of humour, music and song, because they have a decidedly local flavour. Throughout the year, especially in summer, hikers are seen in or passing through the village. Many of them are walking along the Pennine Way, which goes along the tops of the hills above Wessenden to Standedge and into Saddleworth. Many of the hikers and some motorists find their way to the Youth Hostel, originally the branch of the Co-op at the bottom of Binn Road. Hotel accommodation is now available at the Coach & Horses Hotel and at Hey Green. Both have restaurants and Cater for parties and evening dinners. The Great Western Hotel and the Eagles Nest, both near Standedge cutting also provide meals including evening dinners. Marsden still has ten public houses, a Conservative, a Liberal and a Socialist Club, as well as the Pule Side Working Men’s Club and the British Legion Club. With the opening of super-markets in Huddersfield to which people with cars can travel a number of shops in Marsden have disappeared. The largest is the Co-op which now operates as a small supermarket occupying the original grocery and drapery shops. 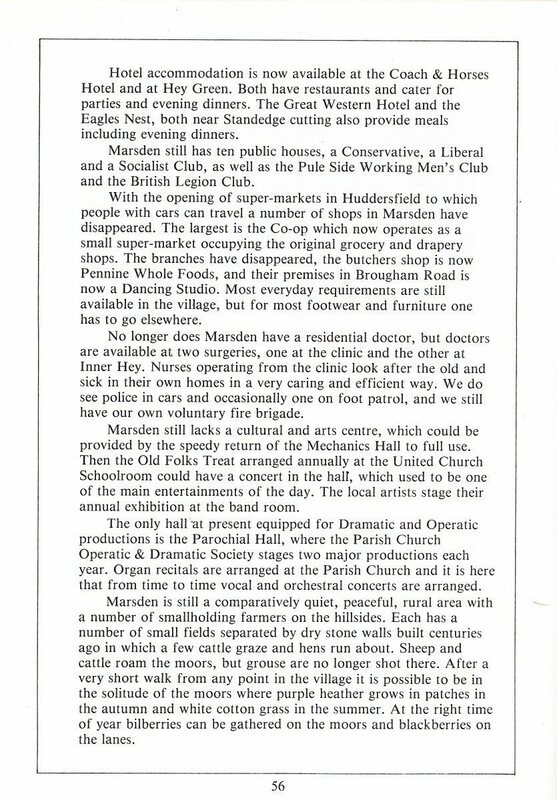 The branches have disappeared, the butchers shop is now Pennine Whole Foods, and their premises in Brougham Road is now a Dancing Studio. Most everyday requirements are still available in the village, but for most footwear and furniture one has to go elsewhere. No longer does Marsden have a residential doctor, but doctors are available at two surgeries, one at the clinic and the other at Inner Hey. Nurses operating from the clinic look after the old and sick in their own homes in a very caring and efficient way. We do see police in cars and occasionally one on foot patrol, and we still have our own voluntary fire brigade. Marsden still lacks a cultural and arts centre, which could be provided by the speedy return of the Mechanics Hall to full use. Then the Old Folks Treat arranged annually at the United Church Schoolroom could have a concert in the hall, which used to be one of the main entertainments of the day. The local artists stage their annual exhibition at the band room. The only hall`at present equipped for Dramatic and Operatic productions is the Parochial Hall, where the Parish Church Operatic & Dramatic Society stages two major productions each year. Organ recitals are arranged at the Parish Church and it is here that from time to time vocal and orchestral concerts are arranged. Marsden is still a comparatively quiet, peaceful, rural area with a number of smallholding farmers on the hillsides. Each has a number of small fields separated by dry stone walls built centuries ago in which a few cattle graze and hens run about. Sheep and cattle roam the moors, but grouse are no longer shot there. After a very short walk from any point in the village it is possible to be in the solitude of the moors where purple heather grows in patches in the autumn and white cotton grass in the summer, At the right time of year bilberries can be gathered on the moors and blackberries on the lanes. My ancestor the Rev.James Bond was the Indepenent Minister from 1824 to 1846 at the Marsden Congregational Church, and in the Church history book written by Rev.Luke Beaumont, there is an appendix which lists 18 persons having the surname Mellor. One such entry is JAMES MELLOR, Snr, 19th January 1843, age 78 years. On my reckoning this may well match your interest. Further, the above mentioned AGNES BOND b. 6th Mar 1830, daughter of James x Betty married a JOHN MELLOR b. 1826 Marsden, they had a son GEORGE MELLOR b. 1854 Marsden and a daughter ESTER MELLOR b. 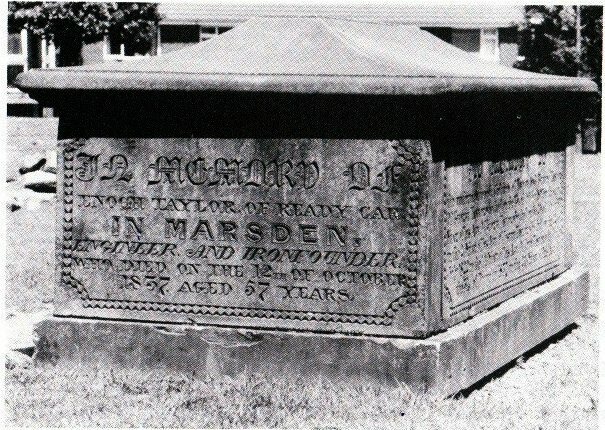 1857 Marsden, Ester died 12th Nov. 1884 and John died 1887. I am currently preparing my website ‘Bondworld’ which will feature Marsden info, and hope to get it uploaded when I have sorted out a WS_FTP software programme, meanwhile if there is anything else I can contribute please let me know. BTW I have visited Marsden and tried to locate the “tombstone” of my Rev.James Bond (died 25th Mar 1856) without avail, apparently nobody knows what happened to the graves at the Buckley Hill Chapel graveyard, so I imagine the 18 graves of the Mellor family are also in the same position. The name Mellor has a very long association with Marsden. In a manor rental document dated 1425 both William Mellor senior and William Mellor junior were tenants and there have been Mellors resident in the village ever since. There are 121 Mellors listed amongst the baptisms at Marsden church between 1734 and 1782. They are particularly associated with the area known as Clough Lea where they appear to have resided continuously for some 400 years and where a lovely arched stone footbridge across the river Colne, built in the mid 18th century, is known as the Mellor bridge. 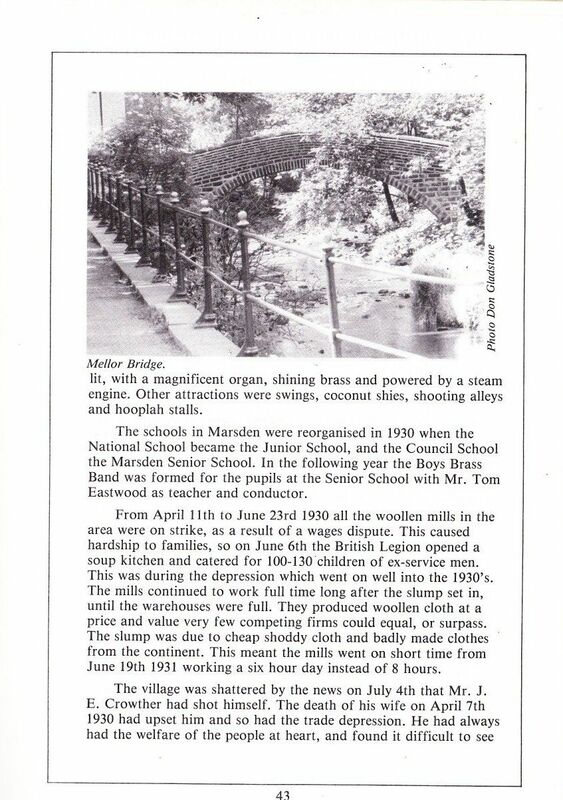 I have no knowledge of a Mellor who was a school teacher in Marsden in 1758, as far as I know there was no school in the village until Rev Bellas started one in the late 1700’s. There is a John Mellor listed amongst the benefactors of the new Chapel (anglican) built in Marsden in 1758. I understand that the old Buckley Hill Chapel graveyard was destroyed when the new Congregational Chapel was built there in 1858. As this was only two years after the Rev. Bond’s death one would imagine his remains were re-interred? I am trying to make the bridge back in time from George MELLOR (christened 20 Feb 1779) to his father, George MELLOR (the elder), who married and Lydia WOOD – daughter of Joseph WOOD, on 7 Feb 1765 in Almondbury. The younger George Mellor (who died 31 March 1857) was the SUNDAY SCHOOL Superintendent at St. James Church in Slaithwaite for 46 years. His son SAMUEL MELLOR was a school master at Lingards National School (1875). I know the NAMES of these ancestors to be TRUE – but I do NOT know when or where George Mellor and Lydia Wood were born (abt. 1740 – it is assumed). I do NOT know the names of the parents of George Mellor (the elder) who married Lydia Wood. 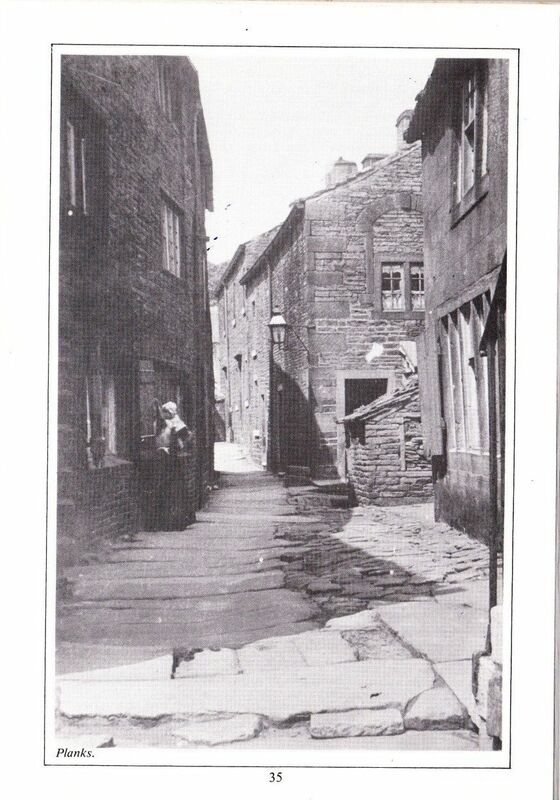 I have made a study of family history in Marsden, my own family having been in the village since the 17th century. During my studies I have accumulated quite a lot of documentation which may help to solve your problem. Please get in touch with me directly on peter@sabretech.co.nz and I’ll do what I can to help. Very interesting reading. Do you have any background of J S Kirk and his wife Hannah who lived at Ing Lees, Marsden or who I might contact in order to find out? Thanks Thelma Farrell, South Africa. If you contact me directly at peter@sabretech.co.nz with an approximate date range for the Kirks I’ll do what I can to help. 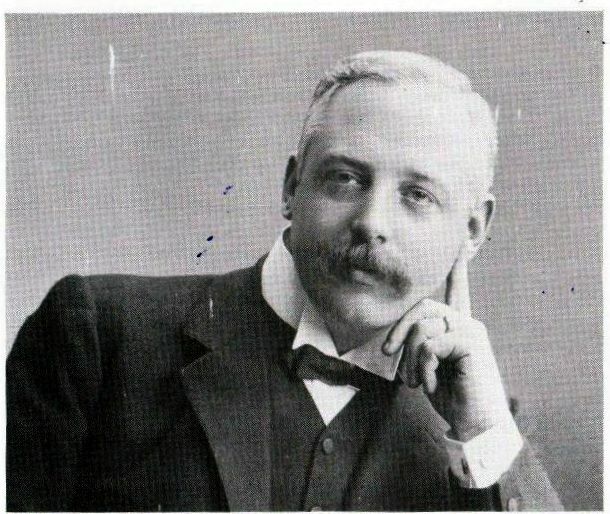 I am researching my ancestor Charles Harries (Harris) who moved his family from London to Marsden around 1891. Given that he had no connections with the area – why? I am descended from James Grime who lived at Reddisher at the beginning of the 19th century. His son was Major James Grime “Marsden’s Most Famous Soldier”. I am trying to find out who his relatives in Marsden were, if anyone can help.